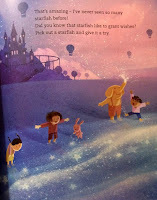 Fallen Star Stories: PICTURE BOOKS! A wonderful book for the little ones. Little Green Donkey is filled with bright, colourful, expressive illustrations. The sparse text t effortlessly tells a story that will hold the interest of the youngest readers. Little Donkey himself has the personality traits of a 2-3 year-old and is very appealing as a character. He clearly wants to do his own thing, in spite of his Mums' efforts to get him to try something new. And the story is pure genius! It is funny, witty and full of life, easily demonstrating that too much of a good thing may have undesirable consequences. By the end, it is clear that Little Donkey still has a lot to learn. Simply wonderful! It is such a pleasure to see this wonderful book being reissued and flying the O'Brien Press flag, no less. Originally published in 1991, it quickly became a favourite for Irish children and it's easy to see why. An animated look at the tale of 'An Fear Marbh', one of the Blasket Islands come to life, it has that gentle hint of legend to fire a spark of interest in children. With simple, eloquent storytelling and characterisation, the tale is illustrated with detailed expression and a sense of time and place. 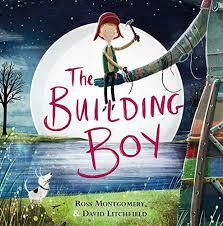 A story of friendship, understanding and imagination, this is one every bookshelf needs. Gentle, yet lively; beautiful to read and to share. 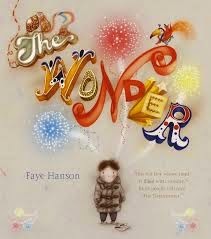 An utterly charming story that explores the inquisitiveness and curiosity of being a child and the nature of the parent/child bond. A father and child adventure, exploring around them with genuine interest and excitement, discovery an array of wonders and learning about the world is matched by the expressive of the comfort and security of home. The richly textured illustrations evoke the atmosphere throughout, whether the black and white of the underground and the nighttime, or the vibrant brilliance of the day. The pictures also perfectly echo the expression of feeling and emotion between father and child. 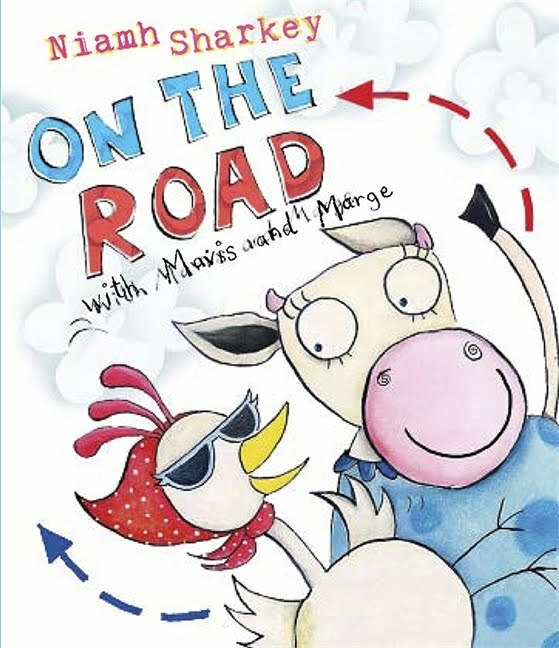 Tender, warmhearted, gently humourous and engaging for both parent and child. Have you met any hedgehogs, yet? Let's follow them as they travel at night and find out what they get up to over the year. They're small and spiky and if they get frightened or stressed, they curl up into a tight little ball. If you hear a snuffling and chuffling nearby, look carefully and quietly. It could be a hedgehog looking for a tasty treat. Or it could be a whole nest filled with Mummy Hedgehog and her little babies. She'll have to take extra special care of them and teach them well. They grow so quickly and there's so much to learn about the world. You never know where you might meet them! Children are always fascinated with the natural world and the Nature Storybook series is the perfect introduction. I will admit that this is my favourite; I love hedgehogs! This is a delightful story that is full of hedgehog facts. It is fun, interesting and sure to inspire a lifelong interest in exploring nature. 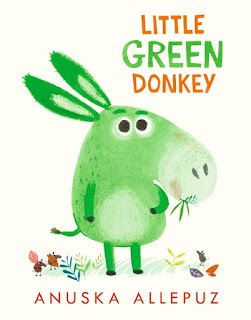 The illustrations are adorable, quirky with a suitably earthy palette and accessible details for even the youngest readers to observe. At the end of the book, there is a page dedicated to "Making Your Home Hedgehog-Friendly". Hopefully, you'll be able to entice these marvelous little creatures into your garden and make some new spiky friends. An index helps you with any hedgehog questions you may have. Fact-filled, engaging and simply wonderful! As a little girl growing up in Iran, Minas' whole world revolved around her Grandma. Together, they would go to the mosque for midnight prayers, send baskets down from the window for the bread boy to fill, gaze at the night sky and play at being astronauts and visit their best friends next door. Mina and her Grandma were never far apart. 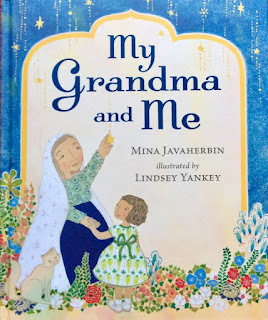 Grandma shared all the day-to-day activities and her gift of imagination and quiet moments with Mina; and taught her many things. And many years later, though she has traveled the wide world, her Grandma remains at the centre of her heart. This is a gentle, eloquent story that is uniquely personal and universal at the same time. An autobiographical picture book, it clearly demonstrates a gift of love between generations and the impact that has in the lives of both young and old. The importance of imagination, understanding and the time to just be together shine through on each page. As Grandma and Mina visit their neighbours, the depth of friendship and similarities that hold much more power than differences is portrayed with great expression. 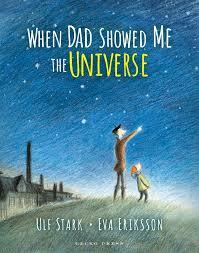 A beautiful book to share, it holds a space where we see that it is the small moments that become lifelong memories. It brings the youngest readers (and older ones, too) to a country and culture that is rarely seen in picture books and opens an opportunity for curiosity, compassion and understanding to grow. The illustrations are rendered with a subtle, yet rich palette, loaded with evocative detail. It is easy to lose yourself among the pages. Above all of this, it is a story of love between a grandparent and grandchild...and that is a rare enough gift. All of this is expressed quietly, making it a very special story. Warmhearted, exquisite and wise...what a joy! 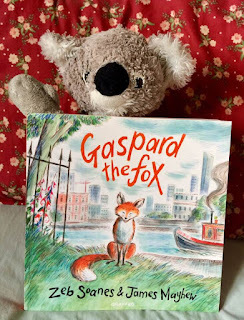 One summer evening, Gaspard the fox sets out in search of adventure. Along the way, he meets some new friends; a very elegant cat named Peter and a dog called Finty who is a bit of an escape artist. They help Gaspard find his way to the canal and navigate between the colourful boats, cafes and people in search of a bite to eat. His adventure turns out to be not quite the one he had in mind. As he makes his way home, he's starving! Gaspard will meet another friend; the nice man on the bicycle comes along and gives him a very special surprise for dinner. In his cosy den, with a full tummy, Gaspard settles down, knowing the future is full of happy adventures and good friends. As we all know, foxes are venturing into the urban environment more and more often. This delightful picture book (based on the story of a real urban fox) brings us a day in the life of an urban fox, highlighting the relationship with the people and other animals with who they share the city. Each animal and person in the tale has a distinct character, relayed through both text and picture. 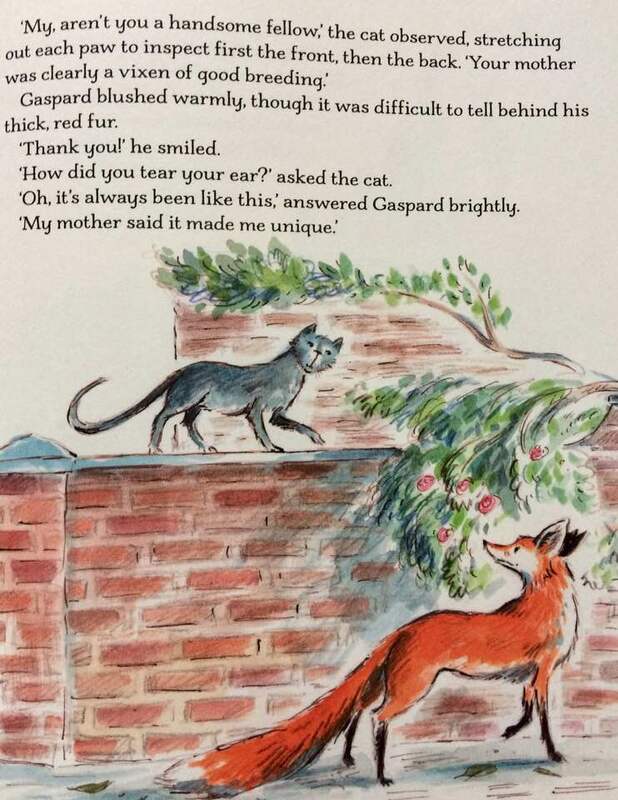 One of my favourite moments is when Peter the cat tells Gaspard, "Your mother was clearly a vixen of good breeding." Filled with a gentle humour and excitement, it is utterly heartfelt in it's depiction of these wonderful creatures that share our world and lend an understanding of their lives. The illustrations are perfect; adding real personality and fascination. The little details throughout create a vivid picture of an environment we see everyday but take for granted. We see the city from a fox-eye-view. At the end, there are 'Foxy Facts' and activities allowing readers, young and old, to really get involved. But the story...oh, the story! This is one that you will love; charming, informative, entertaining and a bit of an eye-opener. It is a very wet day when Maya sees Cat perched high on a rooftop, as wet as a seal. Cat won't come down until Maya manges to coax her with a tin of fish. 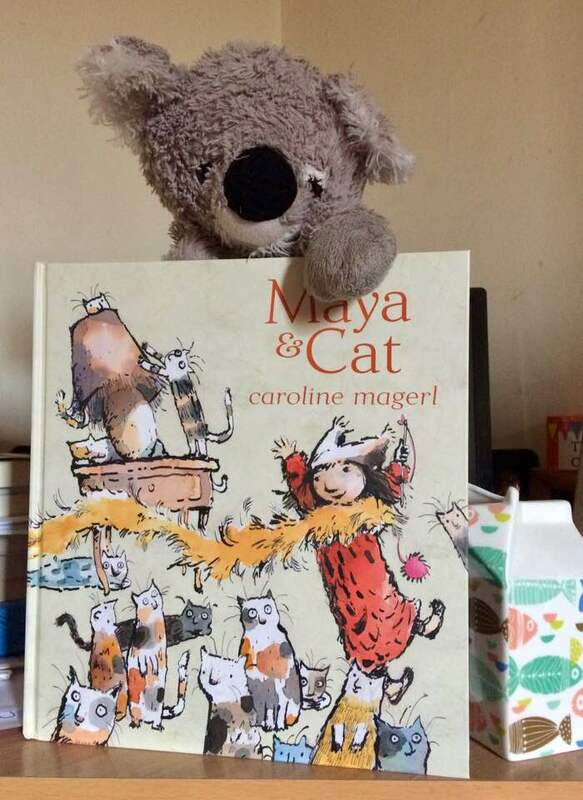 One of the windows must be Cats' home, so Maya leads her on a journey to find the person who belongs to her. Cat follows politely, but in the end, it is Cat who leads Maya to a home with a surprise waiting just for her. With poetic description as painterly as the pictures, this is a peaceful, kind story of caring, friendship and persistence; of being lost and being found; of adventure with a very happy ending. The story reflects a sense of belonging and reuniting with the delight that occurs when two friends find each other and want to do right for each other, with a sweet and easy text filled with warmth. The illustrations, which are done in the perfect tone to express the atmosphere of a grey, rainy day, also have a sparkling quality, filled with touches of gold, reflected light and sky and Mayas' bright red clothes that bring shimmering and warmth to each page. The loose, joyous rendering allows for the juxtaposition of action and stillness throughout the story. The movement and expressions of the characters remind me somewhat of Sendaks' visual expression (particularly in the character of Maya.) All in all, an affectionate, playful, cosy adventure to curl up with and read over and over and over.... I just love it. Francie's mum is going to have a new baby...a baby sister for Francie! They say goodbye to Grandma and set off home through the pouring rain. And did it ever rain! It rained on everything; the canal, the animals hiding in the fields, on Marcus, the young fisherman. It was raining so hard on the highway that when a big rig passed them, it rocked their car in its' spray and sent them up into the picnic area. While waiting, Francie writes all their names on the steamy car windows. But what will her baby sister be called? Francie needs a name to write. A quiet moment, unnoticed by everyone but Francie and her mum answers all her questions.... and wait until Daddy finds out. With a gentle, lyrical prose, Graham tells the story of a very rainy moment in time that turns out having a great impact on one family forever. Moving and evocative, it really tells the story of family; of the simple day-to-day; of togetherness and quiet joy. The pages are a bit text-heavy in places and this makes it a wonderful book for children just learning to read. But, as always with Grahams' books, it is the illustrations that really set this book apart. There is a natural freedom in its' renderings that really feel like rain and being stuck inside a car. While the story is one of quiet action, the pictures add the details that pack it full; the small plants in the rain, the animals hiding under brambles and in the grass, the numerous cars and trucks crawling down the rainswept roads and faces of all the people tucked inside vehicle. The pictures open up a whole new narrative behind the main story and a awareness of everything surrounding it. Comforting and cosy, this picture book has an everyday enchantment about it. 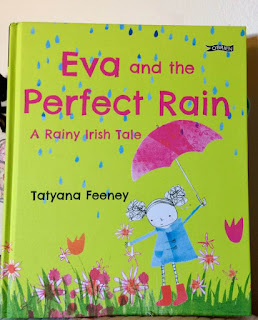 Perfect for peaceful moments, rainy days and bedtime reading, it demonstrates precisely how it is the little things in life that make big impressions. Way down in the jungle, three friends are having fun playing their favourite silly games when they spy Little Crocodile lounging with his Mummy Crocodile. Mummy Crocodile suggests a new game; a game of daring and a test of courage; a game that's bound to make some new friends. Who will be brave enough to creep up to the sleeping creature and KISS THE CROCODILE? Monkey, Anteater and Tortoise don't know much about him, but they can see he has long, pointy teeth, sharp claws and a big, tricky tail. What will they do? 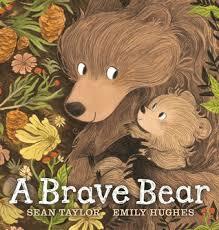 This is a joyful book about making friends and being brave enough to try new things. The simple plot and text pack a lovely, powerful message about letting go of preconceptions in a way that even the youngest child can grasp. 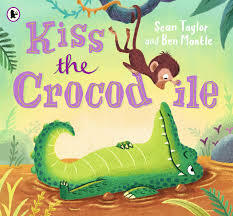 The repeated line (KISS THE CROCODILE) throughout encourages everyone to join in and creates an atmosphere for creative play to grow. The illustrations lend a beautiful texture to the tale with their bright colours, ample detail, entertaining expressions and a child-like, innocent quality. It is easy to understand and empathise with each character and their feelings. I found myself smiling and laughing all the through...especially when loud, bold Monkey finds his courage. Filled with action and interest, loaded with fun, playful, sweet and bound to become a favourite. It's no fun when you're sick. Staying in bed, having a fever, taking medicine (yuck! ), going to the doctor... no one wants to do it!And it's so boring! Sometimes, you even have to go to the hospital and have surgery and that is really scary. What can you do? 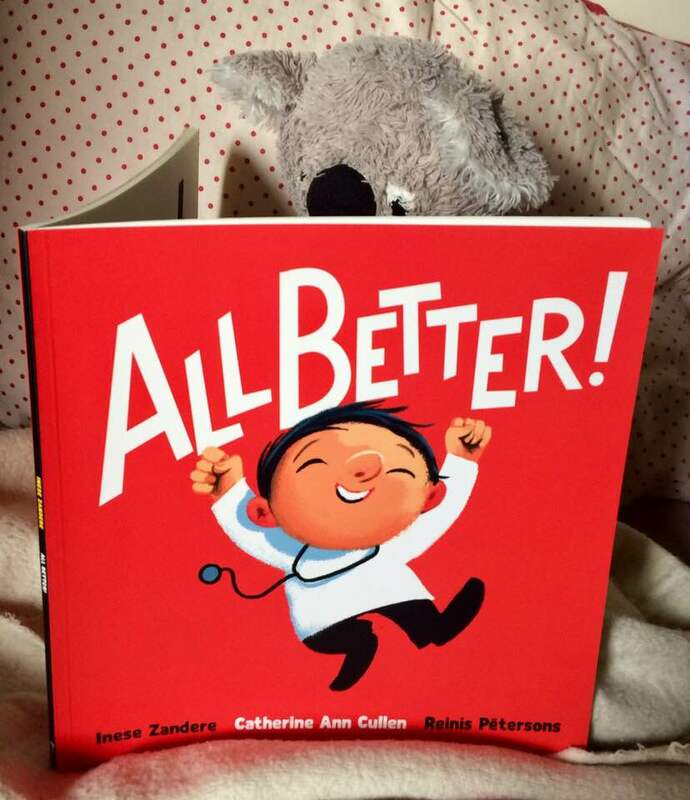 This lovely collection of poetry addresses all the fears and feelings any child will naturally have when under the weather; from having to stay in bed all day to those icky germs that make us ill; from blood tests to broken bones. Light-hearted, whimsical characters and rhythmic, fun rhymes that are easy to remember will have the little patient smiling and singing along in no time. The explanations of medical 'stuff' make sense and are so easy to understand (without labouring the young patient with too much information.) The expressive illustrations are zany, bright and colourful, filled with joy and humour. A wonderful way to bring warmth and comfort into the little patients' experience. And suddenly, everything will seem just a little less frightening. Eva loves umbrellas...especially her brand new, bright pink one! When she wakes up and sees that it is raining again, Eva can't wait to go outside and try it out. But Dad insists on breakfast first and before Eva finishes, it's turned thundery. So she has to stay inside. Thundery rain is not the right kind of rain for umbrellas. Neither is the too soft rain that follows it; or the windy, gusty rain. Eva has to wait but, finally a lovely, drizzly rain starts to fall. The perfect rain! Now...it's time for a perfect rainy adventure. 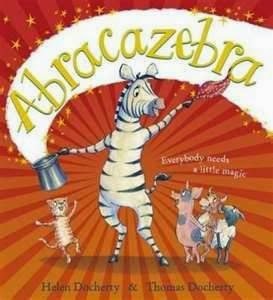 With a real feel for a young childs' personality and their ability to find excitement and fun anywhere, this book is a complete delight. The simple text tells a story any child can relate to...waiting and wanting. It shows Eva, her disappointments and her small triumphs with understanding. But, of course, it is the illustrations that really stand out and bring the entire story to life. It's vibrant, rich palette sees the story change from page to page, expressing the changing atmosphere and Eva's mood. They take the reader along on her journey, making the small things seem as important as they really are through the carefully crafted, yet childlike and free colours and line work. This book is an absolute joy! Wondrous and fun, you're going to love it! As the sun comes up over Skellig Michael, it's going to be a beautiful day...the perfect day for an adventure, thinks little Puffling. Quick as a flash, she out of her burrow, stretching her wings and off to explore. But her puffin parents are worries; they don't know where she's gone. 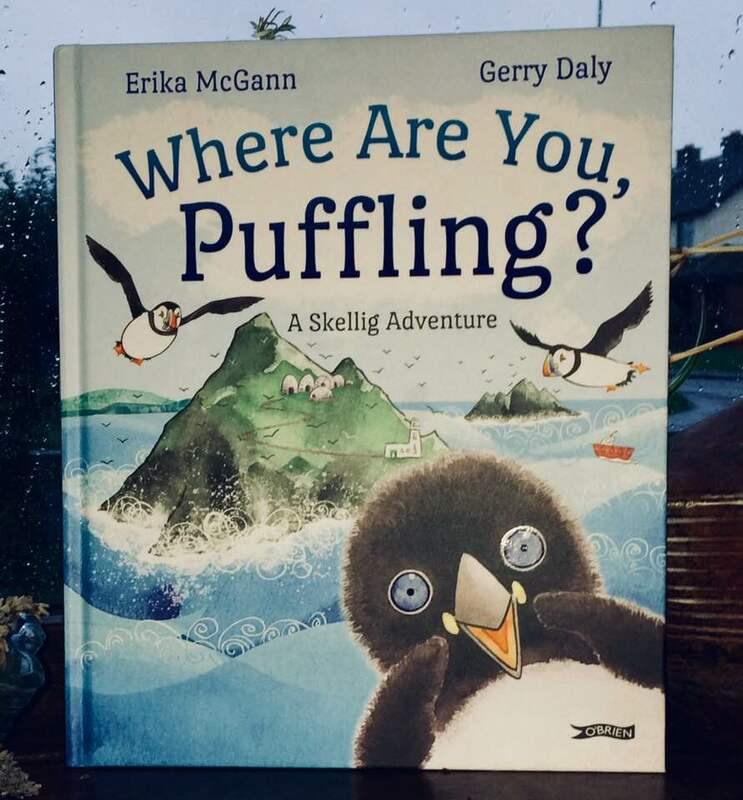 "Where are you, Puffling? ", they call out across the tiny island. All the other animals have seen her, but after helping each one she's run off in search of more friends. When the parents finally spot her, Puffling is need of help of her own! Don't worry, Puffling! We'll get you home. Based on an original story by Sean Daly (illustrator Gerry Dalys' uncle), this lively tale takes us on a trek across Skellig Michael with a real sense of fun and adventure that will delight and entertain. With a keen eye, the richness and diversity of wildlife found on this tiny, rocky island off the Atlantic coast are well-represented; full of character and interest. The star of the show is helpful, cheerful little Puffling, acting as a guide that will warm your heart. The illustrations and story work hand-in-hand to create a vivid tale you'll want to read over and over. Inspiring curiosity; it is completely charming, funny and...be careful; you may even learn a few things. Sometimes, we just don't feel good. Has today been a hard day? Maybe you feel angry, sad or lonely. Maybe you just don't feel like yourself. 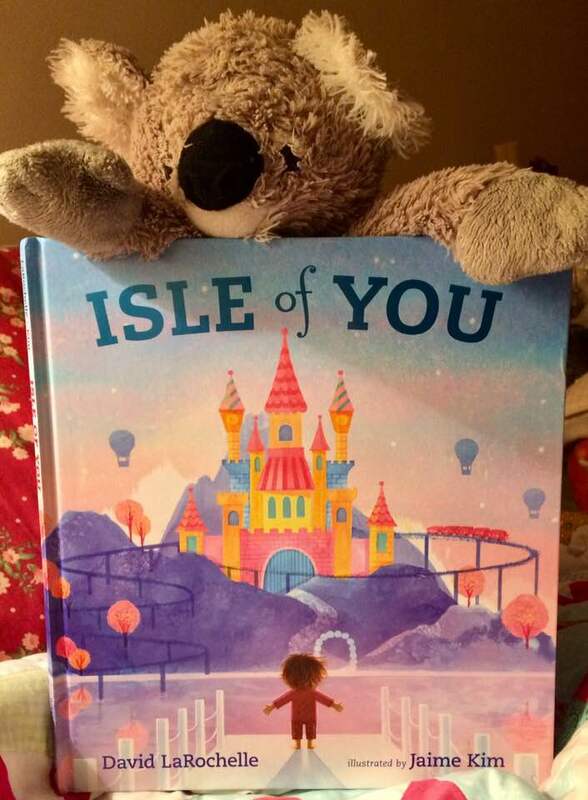 When the day has been a tough one, remember, there's always somewhere you can go; the Isle of You! Inside everyone there is a special place all your own...where a welcoming committee waits to great you with open arms, polar bears are ready to roller-skate your cares away, the castle doors are wide open and you can be anything you want. And there's always a party...just for you! Everything you can imagine can be yours on the Isle of You. Luna and her mother close their eyes and make a wish or two or three and are whisked away on the most wonderful adventures they can imagine. Across the sky the fly; over the ocean and back down to earth for a ride on a snails' back . They tower like giants over the land, until finally, happy and sleepy from all their adventures, they make their way home. A bedtime story to accentuate the cosiness and closeness of the bond between parent and child, this beautiful story also celebrates imagination and creative play. The lilting, lyrical text sends you on a joyous journey through a dreamlike, yet utterly natural landscape. This book is brought to life with painterly, exquisite illustrations filled with detail that simply sing. Each page is beautiful and beckoning. This is a bedtime story that must not be rushed; it calls to be lingered over while the pictures embed themselves into your dreams. 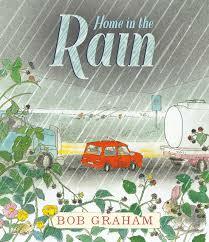 Quiet,soothing and filled with love, this is one of the most perfect picture books I have seen in a long, long time. 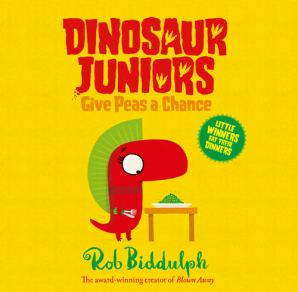 In this new addition to the Dinosaur Juniors series, Rob Biddulph addresses the ‘picky eaters’ dilemma. Those little dinosaurs are back and having loads of fun; running races, playing games, shouting and making their own kind of music. For Nancy, it has to stop for now. It’s dinner time! Dad Dino says Nancy can go back outside as soon as he sees a clean plate. But what’s this… peas! Nancy hates peas! Or any other green food, for that matter. What will she do? Her friends are having so much fun without her! Clever Nancy comes up with a plan that is sure to get her back to her friends in no time. It looks like it just might work. Can she outfox Daddy? 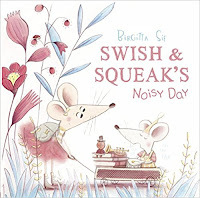 Biddulph’s simple text flows across the bright, colourful pages in an entertaining rhyme that makes this book a joy to read to even the most impatient of young book lovers. The colours and the characters come alive, with lots of action and a quick-witted, fast-paced story that is packed full of small jokes that grab the attention of even the grown-ups. Additionally, it delivers a number of messages in a subtle, amusing tone that doesn’t disrupt the fun. The personalities of the dinos all shine through in the illustrations and there is much to look at on every page with drawings that are clear, lively and deceptively simple. Give Peas A Chance sings (and sometimes shouts!) and is bound to become a favourite. Written in a lilting, rhythmic verse, this is a modern fable of little and large and how everything and everyone has great value and special talents to share. The story is picth-perfect in its' pace and movement; easy to follow and filled with little surprises, a bit of drama and gentle conflict resolutions along the way. The emotional appeal is very strong, very satisfying. Birgitta Sifs' illustrations create a dream-like, enchanting landscape and bring fort a wonderful sense of characterisation. Each page painting, full of texture, with a beautifully suited colour palette. 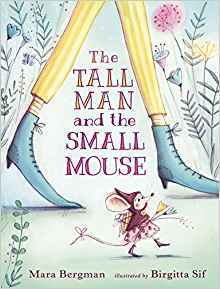 All in all, The Tall Man and the Small Mouse is enchanting; a story of teamwork and true friendship. This book is as gaeilge (in the Irish language). I want to express my hugest thanks to Futa Fata for providing me with the English translation for purposes of review. Go raith mile maith agaibh. When Percy gets on the bus for his new school, he doesn't know anyone. But Percy doesn't mind. He likes it when no one notices him. Percy is very shy and doesn't like to stand out. This is very difficult for a peacock. Percy tries very hard to keep his tail feathers under control. He certainly doesn't want his new classmates to think he's a show-off! When the class returns from a foraging trip in the nearby woods, the school bus is coming and no one can see it because of all the things they are carrying. And the bus can't see them, either Maybe there are times when a peacock needs to shake his tail feathers! This picturebook expresses perfectly what it feels like to stand apart from the crowd and how important it is to understand that the very thing that makes you different may just be your gift. It also is a great at expressing what it feels like to be incredibly shy. The illustrations are adorable and represent a wide range of personality traits with compassion and humour. 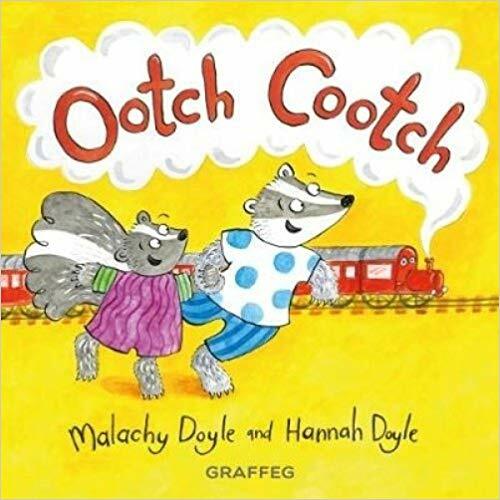 A wonderful story for everyone with perfect pacing and a lyrical text for young children just starting to face social situations on their own. Heart-warming, empathetic and completely charming. Rosalie appears to be an ordinary 5-year-old girl, but these are extraordinary times. 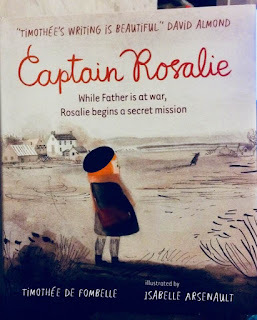 Rosalie is actually a captain on a secret mission; to learn how to read. With her father away in the war, her only communication with him are the letters he sends home that her mother reads to her every night. And every time a new letter comes, it sounds the same as the one before. Surely her father is writing coded letters and if Rosalie could read them herself, she could decode them and carry on with her next secret mission. She carries on and makes great advances. But as she begins to peace together the secret signs and symbols; the words in her fathers' letters; she learns of the harsh reality of war and how her world has changed forever. Timothée de Fombelles' evocative writing opens the world of a childs' imagination and desire to read to reveal something truly special. It invites us into a tale about hope, longing, grief and peace that is powerful, yet quiet and thoughtful. The flowing, minimal language navigates through Rosalies' vision of the world around, revealing the innocence, inquisitiveness and sense of adventure at the heart of the child. It is loving, protective and accepting in its' telling. Arsenaults' illustrations are emotive and set the mood perfectly with their fresh drawing technique, ingenious detail and limited colour palette. The red hues used for Rosalie herself help her character shine forth and sing, bringing beauty, attention and a hint of drama unfolding elsewhere, and that which is about to unfold in her life. As we remember the centenary of the end of the First World War, many exceptional childrens' books have appeared with this dreadful moment in time at their core. This little book stands head and shoulders above them all. Exquisite, heart-wrenching, and unforgettable... simply beautiful. 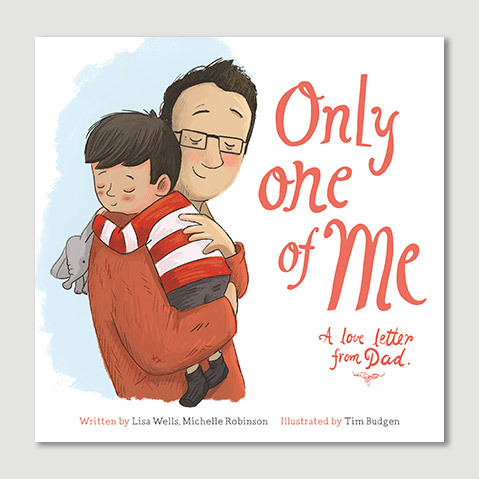 Only One of Me is written as a poetic letter from a father who is diagnosed with a terminal illness. It seeks to help his child remember the wonderful times they had together and to remind his child of the deep bond; the love they shared. And it does exactly that so beautifully. Sadly, there are so many children who lose their parents while they are only young. Preparing them for the moment that Mum or Dad are no longer there is one of the most difficult conversations a parent could ever have. These are things we don't want to talk about...but simply must. This book serves as a reminder, but also to show the child there are so many other people surrounding them that will help them, nurture them and be there for them. No...it won't be the same. But it will be okay. 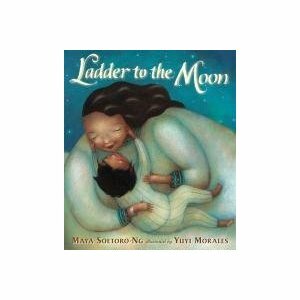 An extraordinary picture book, filled with love, comforting words in simple, poetic verse, this is such a moving and comforting book. The illustrations are charming and inclusive. They bring life and reality while they also bring comfort and the strength of the parent/child bond that will survive even death.I can't think of a better book to help families facing all the challenges that bereavement brings, it is timeless, evocative, moving and flowing with positivity and reassurance. These days, it is important to examine examples from the past to define our heroes; the peacemakers, ‘tree-shakers’, rights activists. 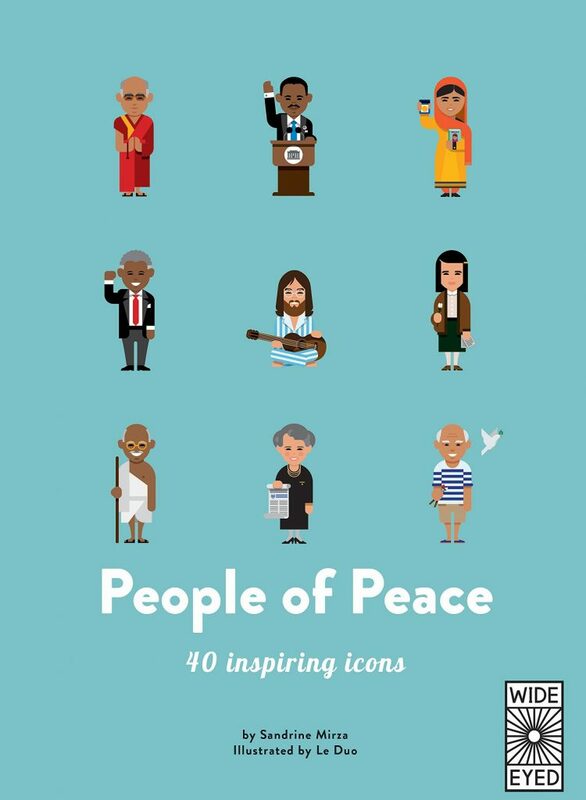 People of Peace contains forty great examples of men and women through history who have dedicated their lives to creating a better world. From the early 1800s to the present day, each page features an historical figure, giving a concise outline of their lives and activities in human rights, environmentalism and peace making. Many are familiar, such as Gandhi, Martin Luther King, Eleanor Roosevelt. There are some less-known inclusions such as Henri Dunant, Red Cross founder in 1863; Sophie Scholl, the German student who lost her life rebelling against Nazi dictatorship and Jody Williams, the anti-war activist who is fighting a battle against ‘killer robots.’ All of these amazing and dramatic examples are offset with bold, contemporary illustrations that illuminate each figure and more than does justice to their contribution to world peace. The addition of the timeline at the back of the book demonstrates that the quest for peace and rights is an ongoing one. There are a few problems with this book. Of the forty heroes featured, only twelve are women; a glaring imbalance at a time of honouring women’s rights struggles. 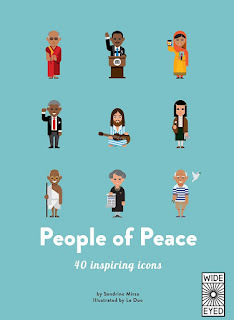 And it could have been more inclusive, giving more representationPeople of Peace is a fascinating, educational book and a sparkling introduction for children and adults alike that is bound to encourage consideration and discussion. A wonderful one to read together! 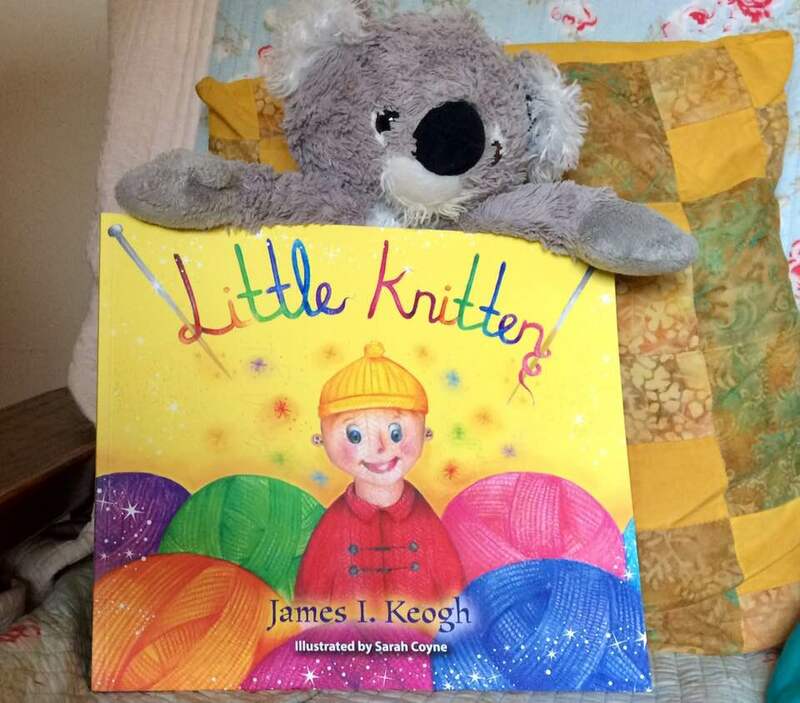 Missy Knitten lives all alone in little Woolly Cottage where she spends her days joyfully knitting and knitting. She can knit anything at all and her home is filled with the most wonderful creations; warm, woolly socks of all shapes and sizes, colourful scarves, even her chair is knitted! But Missy Knitten is lonely. One day, when she makes a trip to town to buy more wool and have a chat with Mr Thimble, Missy comes home with something unexpected; silver knitting needles needles that become magic by the light of the moon and give her a wonderful surprise! With clear, uncomplicated text, a story is woven to take us on a journey of joy and comfort; of community and family; of the magic of wishes. Imaginative and quirky, there is a genuine sense of place and voice that is engaging and familiar. 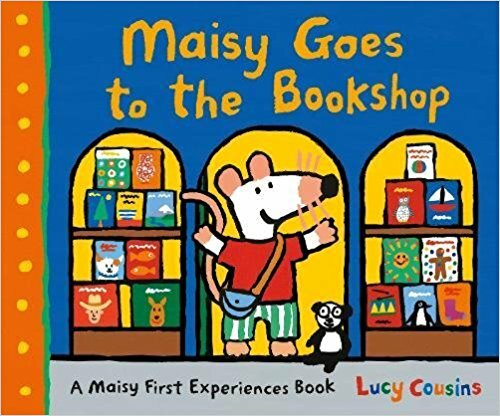 The bright colours and rich texture of the illustrations bring Missy Knitten and her world off the page, lending a strong sense of character and wrapping you in their warmth and delight. A quiet, reassuring tale with a reminiscent style, Little Knitten will warm your heart and make you smile. hide within them. The poem is rhythmic, flowing in a style that will encourage children to learn it off by heart. Don't be surprised if you find yourself or your little people reciting it as you venture out on a walk. It encourages exploration, investigation and observation and brings out a natural curiosity and appreciation for the environment. The illustrations are gorgeous! Sumptuous, precise, yet free, they depict the natural world in all its' beauty and wonder as they display the variety and life-cycles of the many creatures that begin their lives as eggs. It is an amazing book and even the youngest will happily spend many hours pouring through the pages. While clearly written for little ones, this a book to keep and ponder. Utterly fascinating! It was an ordinary day. A little girl ate breakfast with her Mum, Dad and baby brother. There were flowers on the window sill . And then Mum walked her to school. That was when war came. Her whole town was turned to rubble, her home was nothing but a hole in the ground and now she faces a long and dangerous journey on her own, in hopes of finding somewhere safe. But there is no welcome at the end. Until another child, just like her offers her something small, but life-changing. 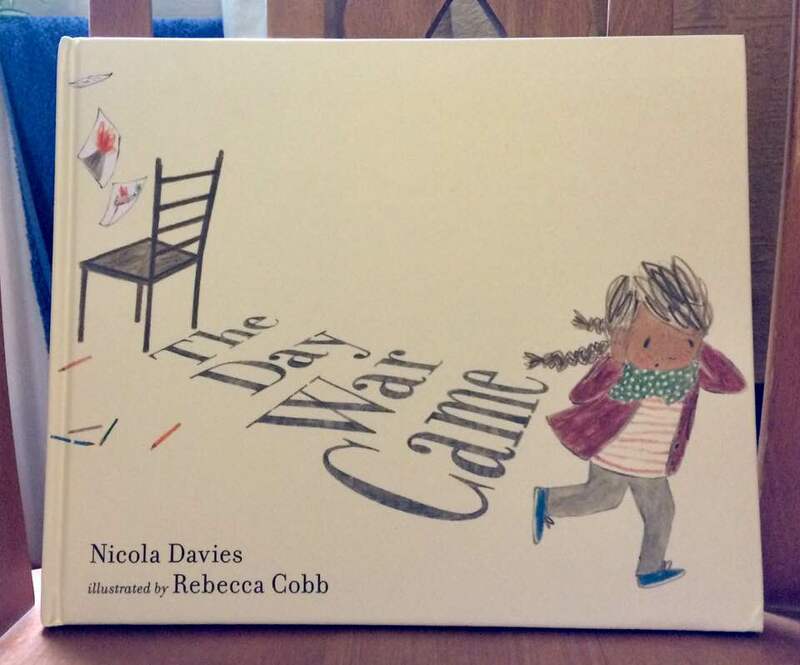 Nicola Davies poem (in response to the UK governments' refusal to offer 3000 unaccompanied child refugees sanctuary in 2016) became this moving picture book that explains the journey of one small girl. It answers many questions children have about the ongoing, world-wide refugee crisis, but leaves many unanswered. You can't hide this crisis from children. They see it everyday. The gentle rhyme leads the reader through the journey, depicted through meaningful illustrations by Rebecca Cobb. The subtle palette and expressive child-like drawings bring an all too vivid reality to the page. The reader can sense the full range of feeling and the cycle of emotions of the central character and ultimately, the relief and simple joy that can be accomplished through one ordinary act of kindness. This is an important picture book for our times. It is beautiful and utterly heart-wrenching; compassionate, determined and hopeful. 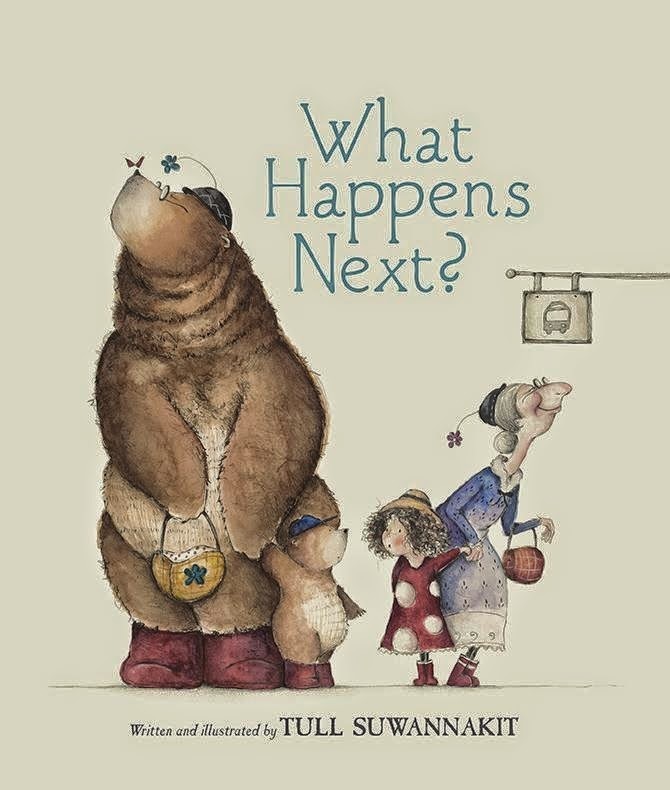 This is a book that helps explain the crisis to children, opening up much discussion. But it is also a picture book for everyone so that we may begin to look with truly open eyes. Stunning. Have you met the Pooka? Probably not. He lives all alone on the mountain, where he mends things, gardens and dances and sings to himself. He is a shape-shifter and can take any form he likes; a goat, a hare, a snail or even a person. And usually he his quite happy, having fun by himself. One day, the Pooka realises he is lonely. So he becomes a snail and has a think and decides there's only one thing to ease his loneliness...he decides to have a big party and invites everyone he knows! And what fun they have! That is until those pesky goblins turn up and misbehave. The extraordinary, magical illustrations are filled with stunning detail and bring life to a lyrical, imaginative text. 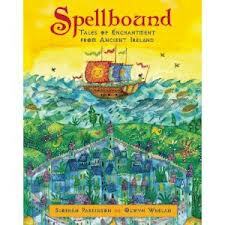 The text winds its' way through the pages, leading the reader on a magical, mythical journey with great emotive impact. The expression of character on the faces is extraordinary. This is a fun and mystical story;each page a work of art. 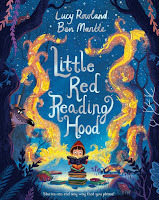 A madcap, delightful tale of loneliness and friendship featuring a legendary shape-shifter, a pack of naughty goblins, the moon and flying cakes; this is one to get lost in for hours. 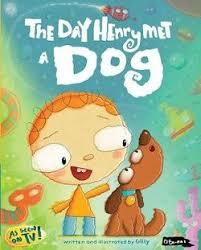 One day, Henry meets Dog. Dog is very sad and lonely because she doesn't have someone to share and play with her; someone who can make her laugh and listen to her. Dog doesn't have a best friend. Henry gets a brilliant idea! Off the two go; into the jungle, rocketing off to space, diving in the ocean, all to find Dog a best friend. But they have trouble finding the right one. Are Henry and Dog in for a surprise? 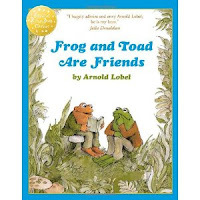 With easy to read language and bright, child-friendly illustrations rendered with unique style, this book expresses a wide array of situations and emotions, hitting on the true meaning of friendship and empathy. Based on the RTE TV series, it is more than just a 'copy' of the show. The Day Henry Met...A Dog stands on its' own. It is a real joy with a feel-good factor that will make the youngest smile. One that will be read over and over. Ceri and Deri are two friends who have the most wonderful time together, wherever they go and whatever they do. In No Time For Clocks, we find the pair having a little trouble manging their time keeping skills. They were due to meet up after lunch, but Ceri has been waiting ages! If only they had some way of telling the right time. In Good To Be Sweet, Ceri & Deri are given a bag of sweets by Bryn of Bryn's Sweet Shop. They work out that they can each have 5 sweets, but they have one left over to share. Dai the Duck comes along and is the perfect friend to give the sweet to, but he does like every flavour in the bag and ends up eating them all. 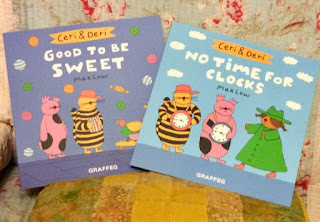 This is a charming series with funny stories and delightful, brightly coloured illustrations. The educational element makes them the perfect books for sharing in the classroom, while the stories themselves make for great read-at-home tales. Here the reader will get concepts like basic maths, telling the time, kindness and friendship. Completely enjoyable, gentle and engaging. Look out for the next to in the series next summer. 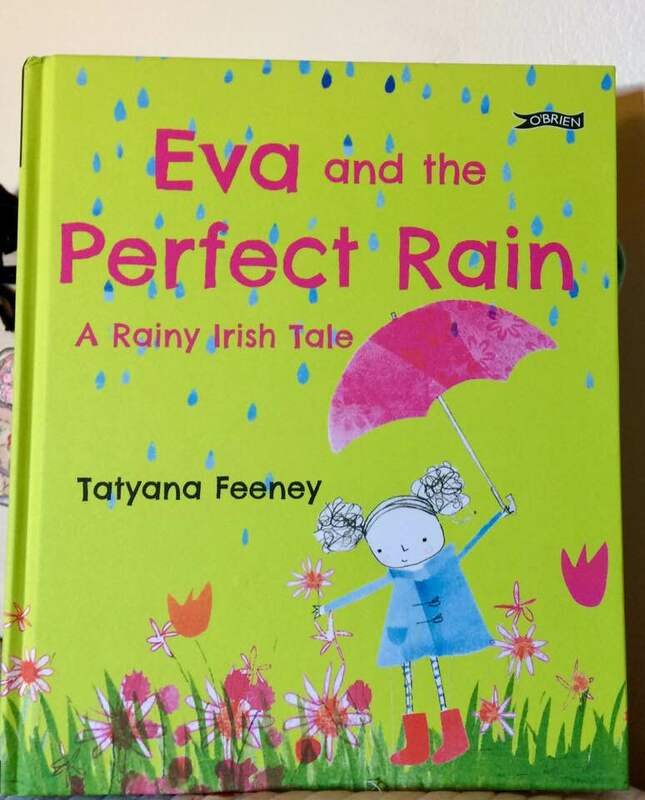 This wonderful picture book was originally published as gaeilge (Irish language) in 2015 and is now available translated into English. Benno is soooo excited about his very first day of school.! He's up early, got dressed and had his breakfast. Benno has everything ready. There's just one prLimitedoblem...Mummy. Mummy is worried and anxious. She doesn't want him to go. She wants him to stay with her. Mummy doesn't know about all these other parents. She wants to stay with him in school. She doesn't want to go home! How will Benno ever convince her that everything will be okay? 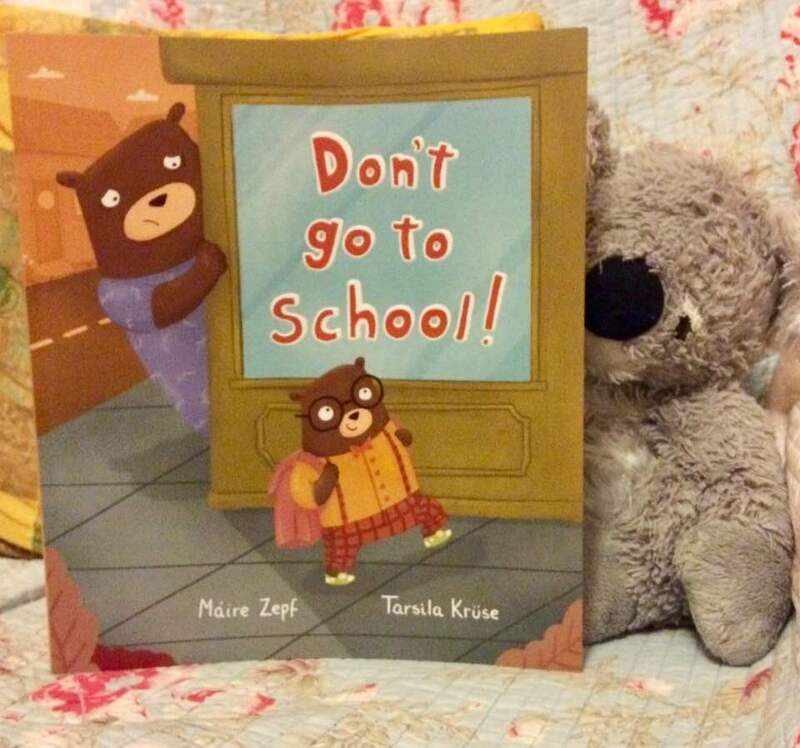 The tables are turned here in a delightful story of going to school and while children will appreciate the ingenious twist, parents will be reassured as well. The clear, humourous text is perfectly highlighted by the warm, contemporary illustrations, painted in a "bear-friendly" palette of colours with great expression. Bennos' confidence is infectious and the portrayal of Mummys' nervous and distressed state at being alone in a strange environment is at once typical and hilarious. The story is one that will help, not only sooth nerves and assist with adapting to change, but introduce a feeling of empathy for others. This will become a favourite, whether its' back-to-school time or not. Reassuring, warm, funny and completely captivating. Cinderfella is constantly and the beckon call of his two obnoxious, bullying brothers. They make him do everything! All the cooking, all the cleaning; they even have Cinderfella cut their disgusting toenails! Karate-champion Kayleigh is having a big party, but Gareth and Gus say Cinderfella has to stay home. But when his faithful dog Ruff finds the invitation, it says ALL the brothers are invited! Cinderfella can go to the ball! But how will he make sure he's the coolest one there? 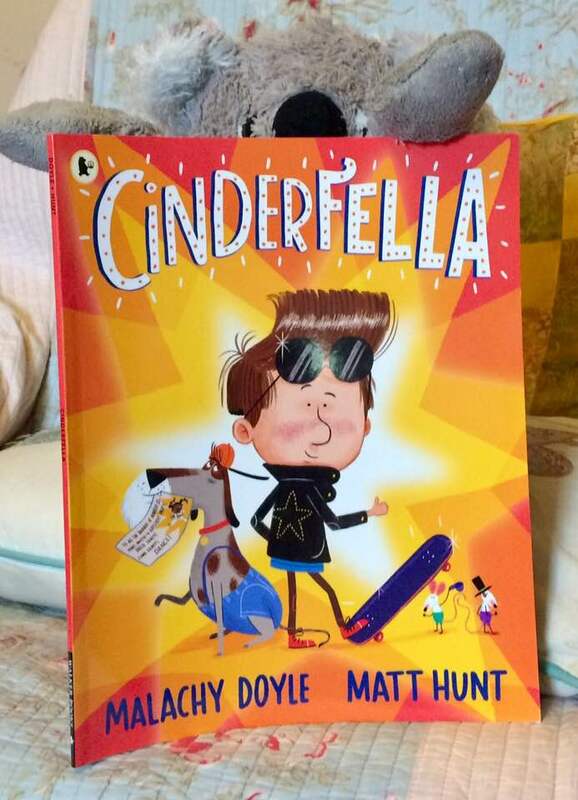 Welcome to the world of Cinderfella; a gender-swapped, modern take on the classic Cinderella story. With appealing characters, an action-packed storyline and situations that are easy to relate to, this book is wonderful. While the text is not overly long, it tells a proper story, one you can really get a grip on. The colourful, contemporary illustrations draw the reader right into Cinderfella's story and help create a lively, laugh-out-loud pace, while the story gives you something worth thinking about. Containing subtle, yet powerful depictions of inclusiveness, it also allows for consideration about feelings and how actions effect others. All the while it maintains an upbeat mood; delight-filled, funny and completely entertaining. Get ready to read this one over and over. The kids will love Cinderfella...and so will you! The Badgers are headed off on a train trip when they come across Little Skunk, who has been separated from his family. He only speaks Skunk and all the other animals are a bit distrustful of his difference. Their nervousness makes them act silly and unhelpful. But Bel Badger speaks a little Skunk; she learned it in school! Even though she only has a few words, Bel listens very hard and soon works out what the trouble is. But can she figure out how to help Little Skunk? 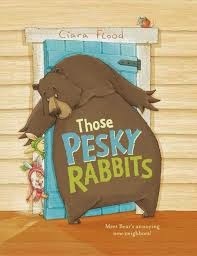 This warm-hearted picture book is an utter delight, while addressing issues of prejudice and acceptance. It helps foster an attitude of tolerance and genuine curiosity of each other. Little Bel really bucks the system in her earnest efforts to help her new friend and discovers that a new and exciting adventure await those who are willing to be open to difference. In opening herself to new experiences, she also helps others do the same. 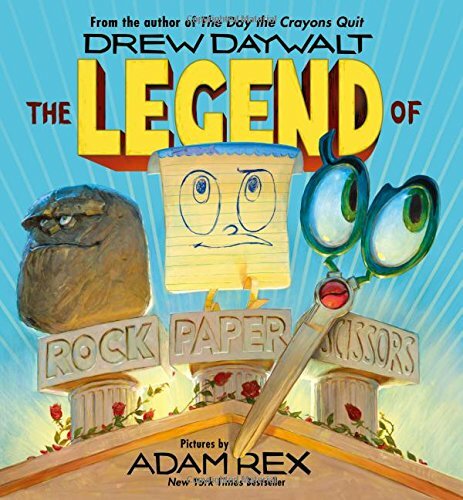 In addition, this book is entertaining and imaginative! Light-hearted with just the right amount of drama, there are laughs and truly joyous moments during a marvelous journey that offers insight and thoughtfulness. The bright, coulourful illustrations are energetic and amusing, with a great expressive quality that allows you to view the characters' true personalities. And young Bel reveals herself to be a hero just by being a true friend. Upbeat with a great pace and wonderful plot, this is one everyone will love. This contemporary narrative of a classic fairy tale favourite not only gives a new look to the story. It turns it on its head and encourages the reader’s right to enter the tale and make it their own. Little Red has an overdue library book and it must be returned today! On her way, she encounters her familiar foe, the Big Bad Wolf. The Wolf hurries off with a wicked plan, but Red strays from her path and wanders around in her reading for a bit. Finally arriving at the library, Red remembers how the story always goes and thinks it’s time for a new ending. With help from the bold and brave librarian, they open the Wolf’s eyes and show him he has been limited in his own story. A new ending is created… and they all live happily ever after. 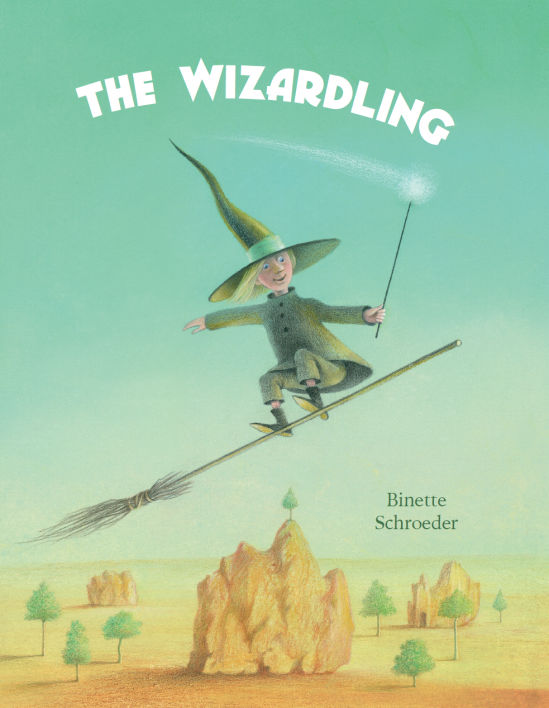 Focusing on the magic of reading and the importance of creative play in stories, this is a joy of a picture book. The clever rhyming text leads the reader through a colourful landscape of woodland and daydreams. It is alive with rhythm and texture, fun and drama; and places the reader where they belong… in the heart of it all. 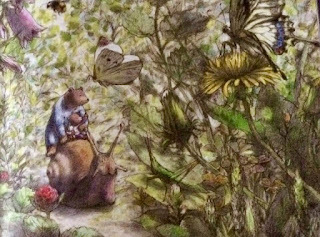 The detail in the illustrations offers the opportunity to imagine different journeys and a variety of outcomes not just in this story, but in all books. 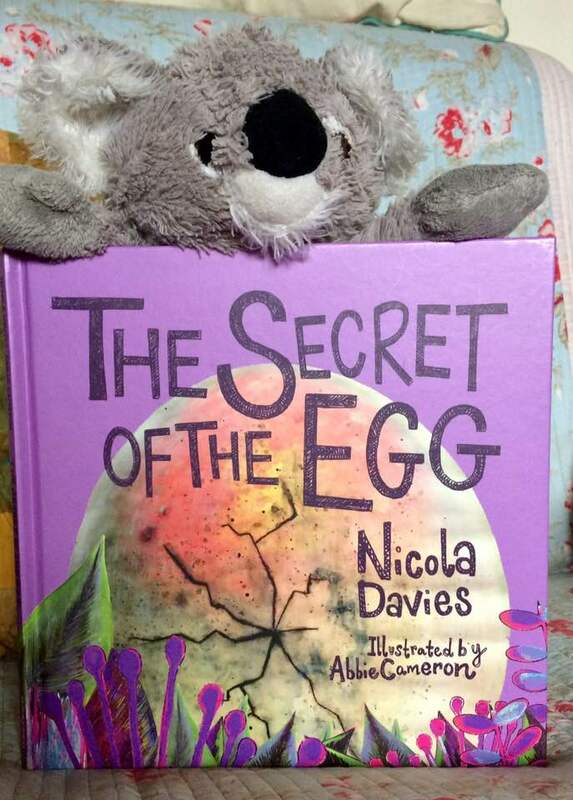 A truly enchanting book, it will appeal greatly to even the youngest. 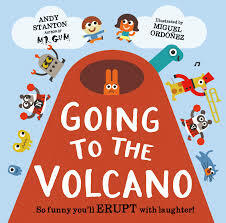 Jane and Dwayne are going to Spain to see the volcano. How will they get there? On a train or a plane? Maybe they will have to ride a Great Dane! So off they go on their great adventure, seeing many new things and meeting many new people along the way. What could possibly go wrong? 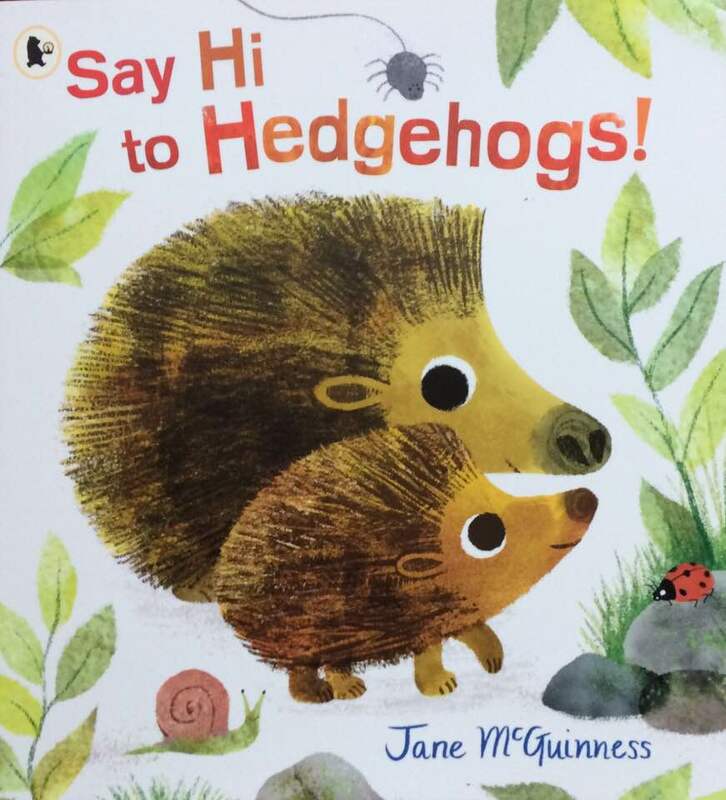 Told in very simple rhyming verse throughout, this picture book is perfect for little adventurers (and bigger ones, too.) The lively, contemporary style illustrations bring expression and humour to an already hilarious story, lending action and fun with a 'Where's Wally' feel throughout the book. Each page is fast-paced, bringing in new characters along the way and filled with antics that add to the suspense. Just so you can keep track, there's a wonderful, illustrated glossary of characters at the end. Hours of entertainment and laughs; it is irreverent, joyful and just great fun! Molly wakes one morning to find her house empty. There has been a wild storm over night and her Daddy, a fisherman has not returned. 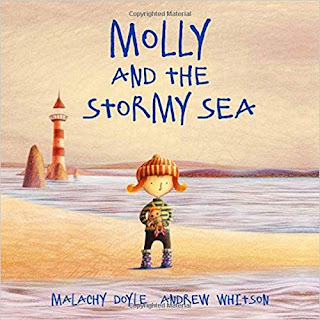 Gathering her favourite things, Molly rushes down to the harbour to find the fishermens' wives crying on the docks.With the storm still raging, she offers the sea her most prized possessions if only it will bring her Daddy home. And then, just when it looks like all is lost, something truly wonderful happens! Timeless and heart-warming, this tale speaks of love, sacrifice and hope. Doyles' pitch-perfect writing pull us through the story with gentle, soothing tones inspiring the reader to look deeper, go further. Great care and consideration is given to depicting a vignette of the life of this small island girl. Using clear, concise language, he weaves the story with just the right amount of drama and nuance and conveys a message that everything will be all right. The stunning pictures by Whitson lend mood and atmosphere, with the use of light and colour adapting to each page. The effect is simply magical. This is a wonder of a book; perfectly illustrated and loving told; one you will want to read and share again and again. This is a welcome return to the Jolley-Rogers in picture book format! 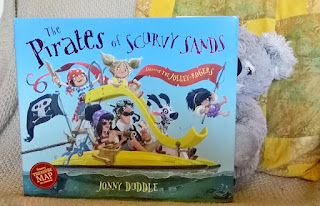 A raucous jaunt of a tale with Duddles' brilliant pictures, rhythmic text and lots of pirate dialogue, The Pirates of the Scurvy Sands is a big winner (as are the previous Jolley-Rogers stories.) Quirky, cartoon-style illustration with all the colour and texture of the seven seas bring this tale to life. While it's loaded with positive messages about friendship, acceptance and courage, it's also just plain fun. 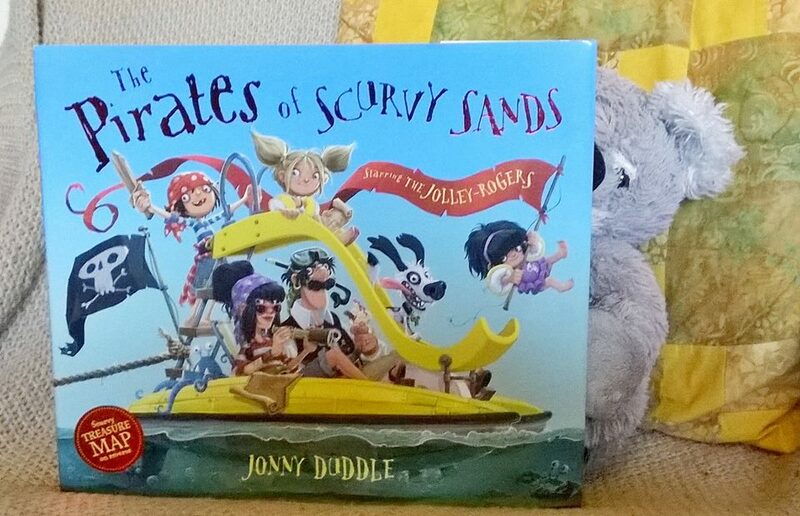 The now familiar characters bring humour, fast-paced adventure, imaginative summer fun and more swashbuckling pirates. There's even a treasure map! Simply fantastic! 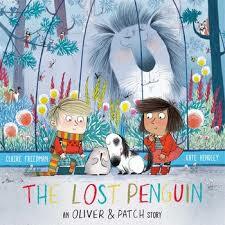 In this return of friends Ruby, Oliver and Patch, our fabulous trio are off to visit the city zoo. Oliver has great fun growling at the lion. Rubymeercats are so cute! While visiting the penguins, Patch notices a sad and little baby penguin. Peep is newly arrived and is missing his old home. The wave goodbye, but when they return the next day, Peep has wandered off. It takes the three working as a team to find Peep again, but it also takes all day and when they take him back, the zoo is closed. An argument between Ruby and Oliver drives Patch and Peep away! How will they ever find Patch and Peep? There's a scuffling in the walls and a scurrying across the roof. What's that shadow passing by the window? Things are suddenly missing and sleep is hard to come by. But what does it want and where is it going? And why, oh why has it taken PC Vickers knickers?! The whole town is alert when the Grotlyn is about! 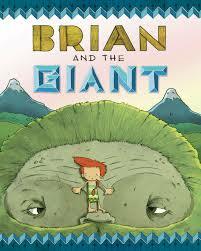 This new picture book by the author who gave us The Storm Whale and Granddad's Island is simply wonderful! A gentle rhyming mystery leads, The Grotlyn inspires a sense of wonder, invites investigation and imagination. It is an absolute joy that will entertain over and over again and wonderfully reassuring. A splendid addition to your bookshelf, whatever your age. Girl and Dragon are the closest friends. Though many miles apart, they share the same dream night after night; to sail away together, having many adventures on the way to the far-est Far Away (where they are sure they will live happily ever after.) And one day, they do! Along the way, they see many strange and frightening things, but together they clear their path and arrive at the far-est Far Away...where they find themselves having the very same dream. So, it's back off over a year and a day...to HOME. 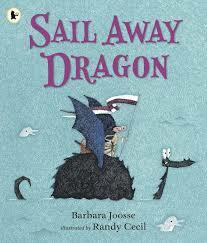 In this, the third installment of the Girl and Dragon picture books, Randy Cecil and Barbara Joosse create a comforting, poetic tale that reassures and enchants.Cecils' illustrations create an atmospheric, dream-like landscape through which Joosses' text moves as rhythmically as the sea upon which Girl and Dragon find themselves sailing. While many stories about about a journey, few have the gentle, yet intrepid quality as this one. There are definite echoes of Sendaks' Where The Wild Things Are, with adventure and discovery and the true sense of home-coming. And Sail Away Dragon satisfies (nearly) as well as my old favourite. An exceptional story filled with friendship, courage and warmth. 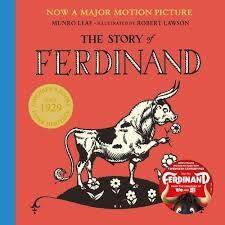 We begin with "Once upon a time in Spain the was a little bull named Ferdinand..." And he was very unlike all the other little bulls, for while they play games racing around, butting heads and being ferocious, Ferdinand is happy to sit under his beloved Cork tree smelling flowers. 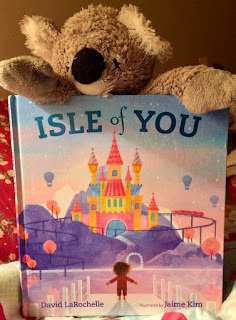 Rachel Bright and Jim Field are back with another of their marvelous collaborations that include The Lion Inside and The Koala Who Could. 'Spontaneous Cyril' really knows how to live in the moment, but without planning ahead, winter is going to prove a bit of a problem for him. 'Plan-Ahead Bruce' on the other hand has a fully-stocked cupboard and just needs one more nut... They both spy the last pinecone of the season and are after it! They race and squabble and tumble along after it, with a nearly disastrous end, only to discover how foolish they've been. A great book about friendship and sharing, this is also heartfelt, laugh-out-loud funny and completely appealing. The rhythmic, rhyming text makes it a joy to read. The illustrations add much to the story, accentuating the characters and action. Two to six year olds (and everyone else) will love to read this over and over again. Perfect for sharing at home or in the classroom. Lucie Goose lives in a little cottage at the edge of the woods where she grows carrots, picks berries and isn't scared of anything...not the wolf with his big "RRaaaaar!" or the bears' ferocious growl or even the lions' Rrrrooooaaar!" They don't understand why they can't scare her. All she wants to do is invite them in for cake and tea. Suddenly, the wolf, bear and lion think cake and tea with Lucie Goose is a very good idea. This charming, humourous and very intelligent story book asks the question, why do some feel the need to frighten everyone? 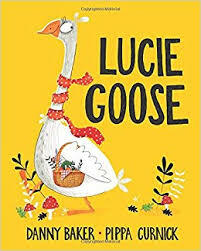 Lucie Goose is a wonderful character; warm and practical with a great sense of friendship about her. She is simply oblivious to fear, never letting it trouble her as she does the things that make her happy. (Frankly, she thinks this 'scaring' business is just plain silly.) It is only the presence of a bigger threat that pulls everyone else together. The illustrations are at once delightful, contemporary and cosy. The text and pictures work perfectly together to create a wonderful addition to your picture book shelf. I really love this one! 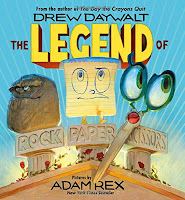 Drew Daywalt reveals the gripping and hilarious story behind the all-too-familiar childhood game in a book that is sure to become a favourite with everyone. In the Kingdom of Backyard, Rock has emerged as an undefeated champion among many fearsome foes. Yet he is unfulfilled. He must meet and battle with a truly worthy opponent. Little does he know that, at that very same moment Paper, from the Empire of Mum’s Study, and Scissors, from the humble village of Junk Drawer, have also set out on the very same, noble quest. When the three warriors meet, who knows who will be victorious. While I can see children poring over this book again and again (probably quite vocally), it is also a perfect read-aloud and laugh-out-loud book. Clever fare from the author of The Day the Crayons Quit, it is a wonderful addition to the bookshelf…not that it will spend much time there. Swish wakes early in the morning to the gentle sound of a ticking clock. But what's that other sound she hears? It's little brother Squeak crunching and munching his breakfast! Through the day, Swish hears all kinds of sounds. And though their eyes might lose sight of each other, Swish and Squeak can always hear where the other has gone. This is a beautifully illustrated, wonderfully told journey through the world of sound. The journey the reader takes will have all thinking more deeply about what we hear everyday. The artwork is exquisitely warm, charming and still evoke real feelings, sensations and exploration. The soft colour palette used invites care and attention to listening in a nearly dream-like way. The relationship between sister and brother mouse is genuinely touching and full. Clever, unique and filled with joy; a story sure to fire the imagination and warm the heart. Birgitta Sif never fails to delight me. From Oliver, Frances Dean Who Loved to Dance and Dance, Where My Feet Go and now, Swish and Squeak...these are picture books that should be on every shelf. It's library day! And, as always, Luna is off to sped it with her dad. He is waiting for her with his nose in a book. As soon as she is in the door, they are off to roam through the stacks. There they find magic, adventure, bugs, dinosaurs and so many worlds waiting for them. 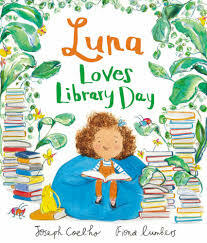 Plopping down in a big, cosy chair, they share a wonderful story together before it's time to check out Luna's books. Back at home, she opens her bag...a bag full of memories of stories, adventures, magic and Dad. Franklin the dragon absolutely loves books! He loves nothing more than reading and sharing his favourites with people. But everyone he meets is too frighten to look at Franklin...let alone listen to him read. On day, Franklin meets Luna, a little girl who has just finished reading all about dragons. And she isn't afraid of him! Together they talk about the books they've been reading; books about roller-skating, King Arthur, how to do Kung-fu; and they hatch an exciting plan. 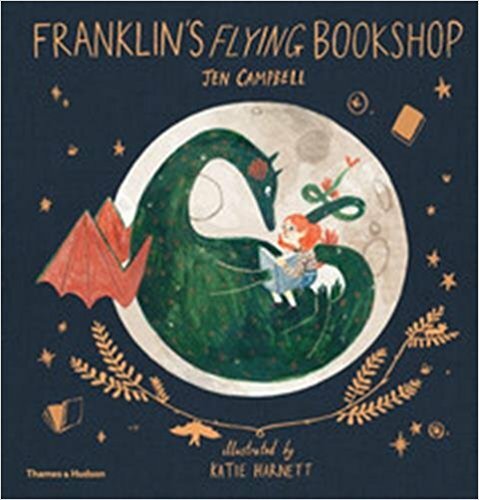 What if they open a flying bookshop on Franklin's back?! They could fly the world sharing books with everyone...but will this solve Franklin's problem? I simply adore this story! 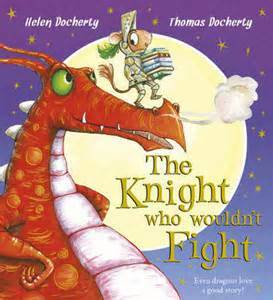 It has everything...charming characters, loneliness resolved by friendship, conquering fears, a dragon and books! Imaginative, well-told and filled with joy, this makes for wonderful bedtime or storytime reading. It is designed to inspire imagination and imaginative play. 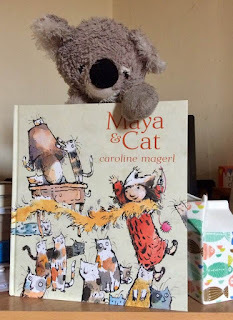 Campbell's storytelling ability is spot on and loaded with attention to detail, which makes the 'wordiness' of the tale easy for even the youngest to hold on to while reading. The wondrous illustrations by Hartnett are clever, contemporary and rich. It is, quite simply, a joy. Well worth a space on your bookshelf, though it won't spend much time there. One to be read time and again. Oh, what a beautiful story to share! The artwork in this unique and wonderful picture book is stunning. The palette is atmospheric, perfectly capturing the mood throughout. With a message of love, longing and imagination, the story is uplifting, peaceful and filled with everyday the magic of true childhood vision. An exceptional feature (apart from Alemangas' incredible artwork!) is that it is written in the first person from the view of the child without a gender assignment; boys and girls both relate to the central character. The view of the magical world in which we live brings to life the use of creativity and imagination to stave off. This is a picture book that I want to put into every childs' hands. 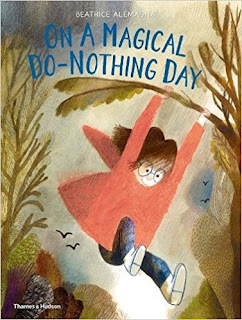 A perfect one to share on your own magical do-nothing days...whether young or old. Look at what the Yoga Babies can do! Throughout their day, they have fun trying out new poses wherever they go and at home. It's tricking sometimes, but so is life...and it's all very, very busy. But yoga can help everyone relax and chill out! I wasn't prepared to love this book as much as I do. 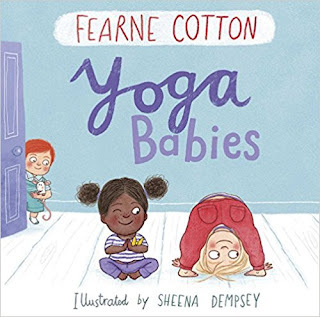 A flowing rhyming text guides the reader(s) through the Yoga Babies day; at home, in the garden, during the day and at bedtime. 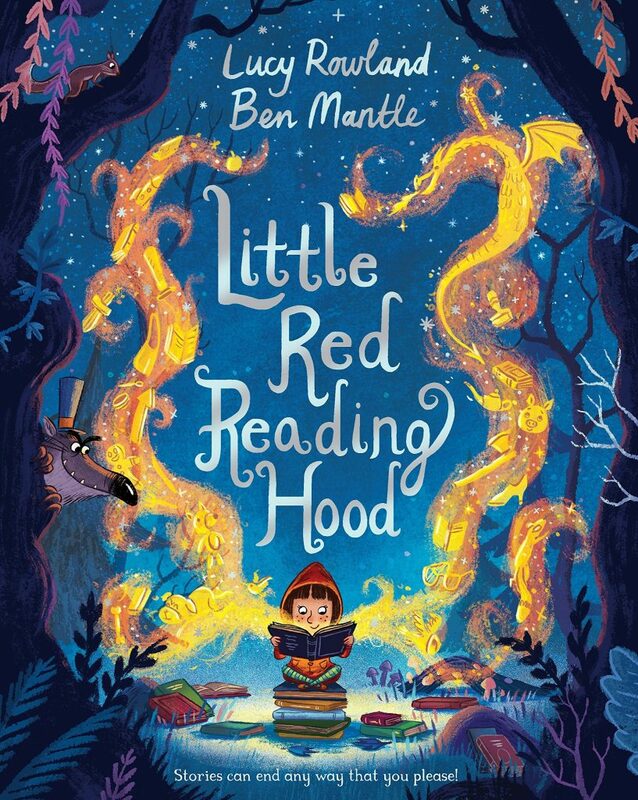 The illustrations perfectly accent the story and bring so much joy to this lovely story.Filled with a soothing colour palette and delightful, expressive rendering, each characters' mood and personality is easily recognisable and relatable. 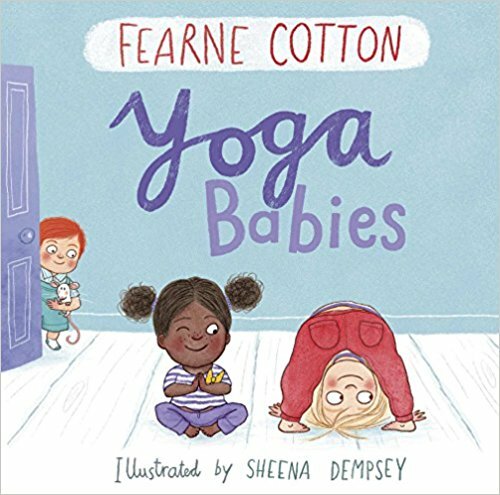 It's a great way to introduce yoga and mindfulness to the whole family (or classrooms for littlies!) But, as it says in the introduction, this is not simply a 'yoga guide' for babies and toddlers. It has a charming story line and is very soothing and fun to read. As I went through the book, I found myself smiling, giggling and feeling much more peaceful. I really can't say any more about this book. Just buy it, read it over and over. Big and small, you will love Yoga Babies! 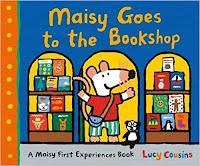 Maisy goes to the bookshop to buy a new book for herself. But she also wants to get a present for her friend Tallulah. She has a big decision to make. The shelves are packed with books of all kinds. Fortunately, the shopkeeper is very helpful and she finds just the right one. She also finds her friends; Charlie, Eddie and Cyril. They have lots of fun imagining all kinds of adventures while they look at the books. And guess what? There's even a storytime! Poor Morris Mole! He's mislaid his glasses and can't find them anywhere. And he's had such a long, long day at work. 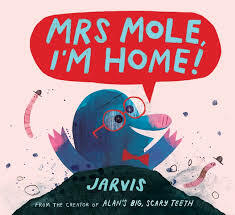 All he wants is to get home to Mrs Mole, his wonderful children and a big bowl of worm noodles for dinner. Surely he can make it home, even without his glasses...can't he? A hilarious and poignant story, this will have everyone routing for Morris as he gets horribly lost on his journey. He winds up everywhere, much to other animals frustrations and laughter. A real 'there's no place like home' tale, the palette is bright and lively and completely suitable, the repetition is fun and the characters and their world are well-defined with a minimal amount of text. From the author of Alan's Big Scary Teeth, this is another winner. 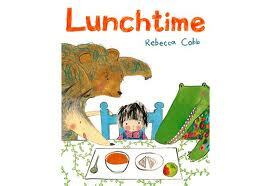 As it gives much to talk about, it's bound to become a storytime favourite. I love it! Little Bear is spending a wonderful, special day with Daddy Bear. Off they go on a walk through the woods, but it is so very hot....almost too hot to do anything. Little Bear suggests that maybe they should go to the river to cool off. But is Little Bear brave enough to make it all the way there? There are many dangers along the way. When they finally make it, will Little Bear be brave enough to jump off the biggest rock into the water...will Daddy Bear be brave enough to let him? One day, William wakes up to find an amazing thing has happened overnight. The tree outside his window has been sculpted into a wise owl. Each night, more and more topiary animals appear on Grimloch Lane, each more wondrous than the last. Soon, the entire town is filled with beauty and wonder and the people around are filled with joy and life. One day, the mysterious night gardener disappears as quickly as he appeared, but the towns' people, and William are changed forever. I love beautiful picture books. And this is one of the most beautiful I have found in years. 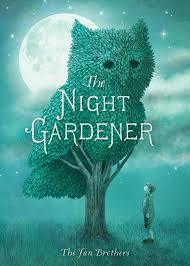 A quiet story that blossoms with the journey it takes you on, The Night Gardener is amazing. Grimloch Lane starts as a dreary little place, grey and sombre. But with each page, a little more colour, a little more life is injected into the place, until the end finds it teeming with sumptuousness and texture. The text is clearly carefully chosen to accentuate the illustrations. Each page is a work of art on it's own, telling an evocative story that, like the Night Gardener himself, will live on in the hearts and minds of anyone who reads this book. Also, it is a perfect bedtime story immediately joining such classics as Goodnight Moon. There aren't enough words to describe the beauty of this book. One for everyone to read and cherish. 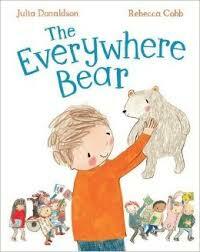 The Everywhere Bear loves the children in class one and all the adventures he shares with them. But one day, he falls out of a childs' backpack unnoticed and discovers he is lost! That's when his adventures really begin. He tumbles down a drain and is washed out to sea, where a fishing boat rescues him. He then ends up on a lorry and a seagull lifts him up and carries him away. The Everywhere Bear, who is really earning his name, only wants to get back to his own little shelf in Class One. But how? I really loved The Paper Dolls, so I was very excited to see this winning pair team up again for The Everywhere Bear. 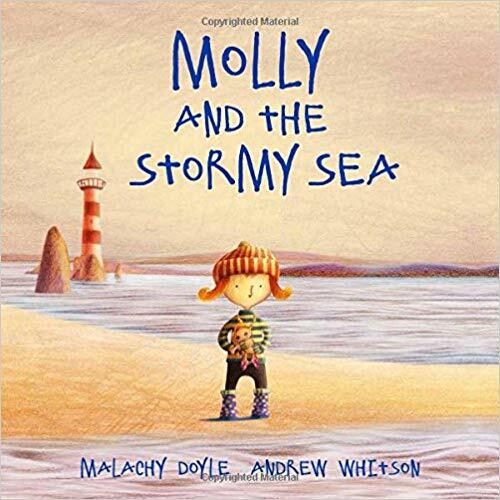 Donaldsons' poetic story-telling shines as brightly as ever in this wonderful book that will soon become a favourite of every child that picks it up. 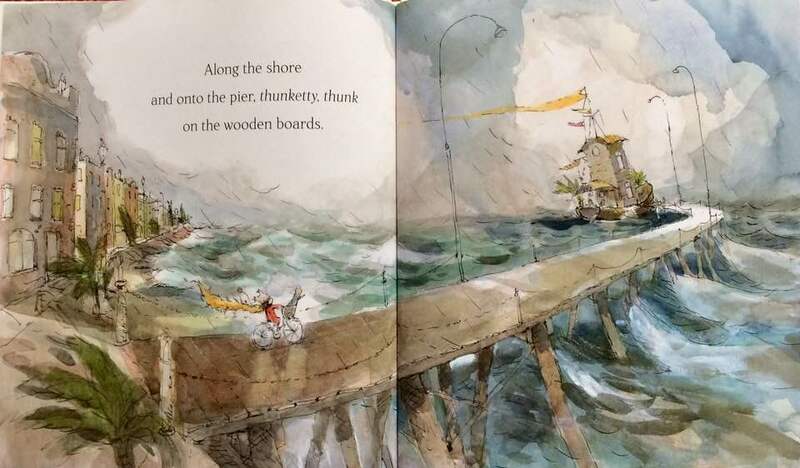 But it is Cobbs' beautiful, lyrical illustrations that truly bring the story to life. Her lively, yet gentle depictions capture the essence of childhood adventure and imagination. This book is an utter delight with a wonderful story line and a message of hope and persistence, while reminding us to look around for adventure is everywhere. This is a most unusualThe Building Boy is an extraordinary treasure. Carson Ellis invites us into the world of a charmingly depicted group of insects. With clever use of a made-up language and beautiful illustrations, the reader is taken through the seasons, as the beetles discover a small sprout that grows throughout the pages. But, there is much more. As the language is essentially nonsense, it is through carefully following the illustrations that we learn about the bugs and there lives, relations and fascination with how the natural world develops. Clean, clear, unusual and completely engaging, the pictures occupy the story and are simply engrossing. Through them, we not only discover the story, but perhaps even learn to speak bug. The book calls for multiple readings, as there is something new to be discovered each time in these exquisitely drawn intricate pictures. Completely intriguing, decorative and joyful, utterly memorable, a story that embraces life and causes the reader to look more deeply. It is almost impossible for me to explain how wondrous this book is; I recommend reading it to understand. 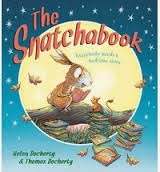 An absolutely enchanting story by the author/illustrator of some of my very favourites, The Snatchabook and Abracazebra! With charming, colourful illustrations and accessible, rhyming text, this is a heartwarming story about being yourself and the power of reading. Leo is a wonderful character, bound to captivate with his confidence and bravery, as he persuades the boldest of enemies to his way. He is who he is and that's all he needs to be. This story is fun, lively, happy and thought-provoking; in short, a complete delight. Another one for your permanent collection as it will be enjoyed over and over and over. I cannot recommend this book highly enough! Mother Owl and her three babies live happily on their branch together with lots of room to spread out or snuggle up. That is, until the bat family family move in. 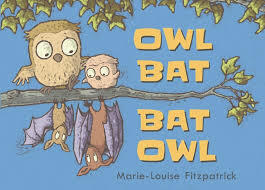 The owls sit up top and the bats hang below, but the two neighbouring families are a little suspicious of each other. It is clear the youngest owl and the youngest bat want to be friends, but owls don't mix with bats and bats don't mix with owls...so best to keep away according to the mothers. But a wild and windy storm kicks up and maybe...just maybe...owls and bats do mix well after all..
A beautiful and heart-warming wordless picture book that shouts loudly about the gift of family, friendship and not judging a book by its' cover, so to speak. 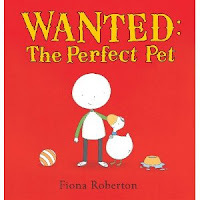 While there is no text to 'read', the story is brilliant expressed through the pages with colour, positioning, facial features and body language. Wordless The illustrations sing with clarity, expressiveness and are uncluttered and simply lovely. One of the best wordless books I have seen in ages! "I am a child of books. I come from a world of stories. And upon my imagination...I float." To describe the plot of this book, you need no more than the opening lines. A young girl, this child of books, sails into the world of a young boy and opens his eyes to the incredible adventure awaiting him in the land of stories. Her world is, given the illustrations, quite literally made up of words. But words make pictures, and this is the gift of stories and the imagination. Initially (and for the youngest readers...or the reluctant reader), this is a tale of a girl and a boy on a marvelous adventure through a world of stories, using their imaginations to create a journey of discovery. But, as stated previously, this world is quite literally made up of words; words from our most time honoured classic books and fairy tales for children. As the reader of this wonderful book becomes more confident, or more curious, they will read the pictures and there discover Alice in Wonderland, Treasure Island, Frankenstein, fairy tales, nursery rhymes...so much. In the end, the ultimate discovery and lesson...imagination is free. 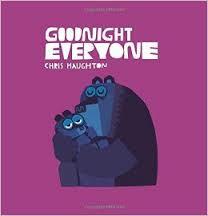 Haughtons' vibrant, sumptuous cut-paper illustrations do as much to create this bedtime story as the text. The colours and shapes, the movement from page to page is exquisite and sit well with his previous books; A Bit Lost, Oh No George and Shh! We Have A Plan. While the palette is bold and decorative, it is also soothing and reassuring. 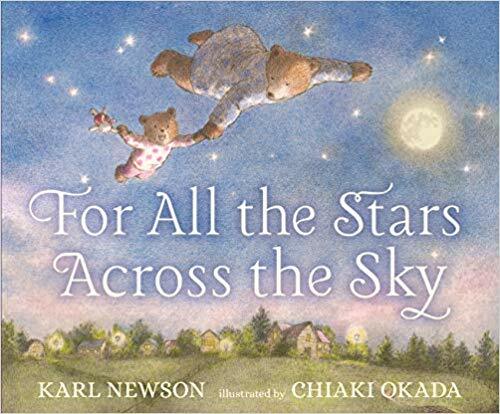 Little ones who can't read yet will be happy to pour through the pages again and again.The repetitive refrain and starry nighttime scenes make this a perfect bedtime tale to share. I would put this one alongside other bedtime favourites such as Goodnight Moon by Margaret Wise Brown and Owl Babies by Martin Waddell. Simply wonderful. 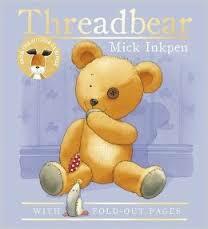 Poor Threadbear! Bits of him are worn out and he has a button for one of his eyes. But none of that matters to Ben. He is much loved and cuddled. Threadbear does have one very big problem. In his tummy is a squeaker that just won't squeak.The man who made Threadbear put in too much stuffing and his tummy is too full to squeak. No one seems to be able to fix it. Not Daddy, not Mummy, not any of the other animals. Determined not to let Ben down, Threadbear seeks help from Father Christmas and he finds himself off on a mission to find a squeaker tree. 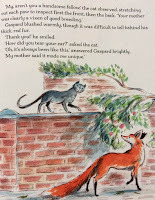 This is one of my all-time favourite stories for young children. A story that, at its' heart is about making dreams come true and being happy with who you are, the charming illustrations from the creator of Kipper and Wibbly Pig make this book come to life. Gentle, funny and moving, this is not only a wonderful Christmas timeThreadbear is one every child will love. Life has changed for Anna Hibiscus. Her world has always been filled with her large wonderful family, but now they welcome two more additions. Now, Anna Hisbicus is a big sister! And brand new twin brothers mean everyone is very busy. With Aunty Joli and Aunty Grace are trying to keep the babies happy, Uncle Bizi-Sunday is occupied with the shopping and Mama and Grandma are sound asleep because the little ones have exhausted them both. It seems no one has time for Anna Hibiscus and shes' really feeling left out. But, of course, it isn't long before everyone is counting on her to be her amazing self....especially the Double Trouble! A fantastic book for parents and children alike that will bring, not only a view of the universe, but an understanding of how things look from another perspective and the parent-child relationship is expressed here with care and insight. Every parent longs to show magical, wondrous things to their children, and frequently are discouraged when reality doesn't meet expectation. But children can find magic and wonder anywhere; with the smallest details the parent can't see. This is expressed beautifully in this book, not only in the story, but in the illustrations which are fresh, dynamic and utterly lovely. 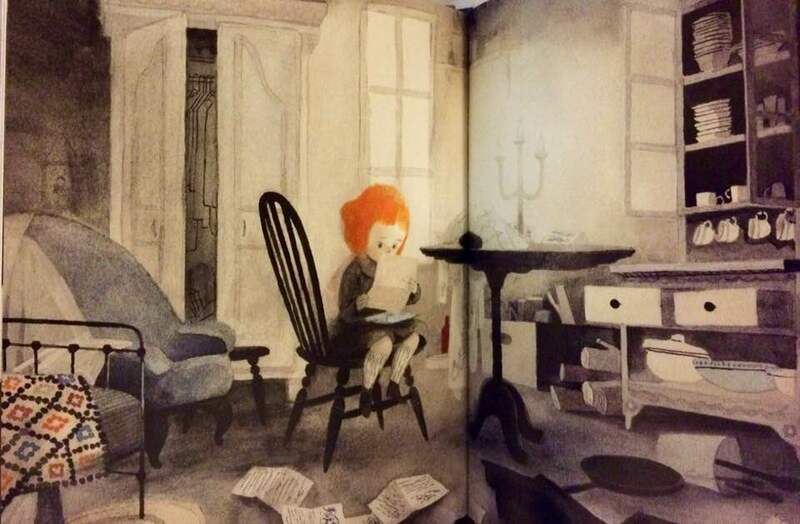 The magnificent Eva Eriksson has been one of my favourite illustrators for many years now...she never fails to express a genuine quality of children and their lives. 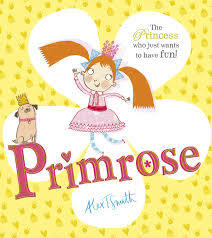 Humourous, adventurous and charming, I highly recommend this as it will become a favourite for the entire family. 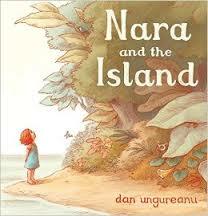 Nara lives on a tiny island with her her father. She dreams of sailing off to a nearby island across the waves. One day, Nara gets the opportunity to visit this wondrous island, where an amazing adventure and a wonderful surprise await her. 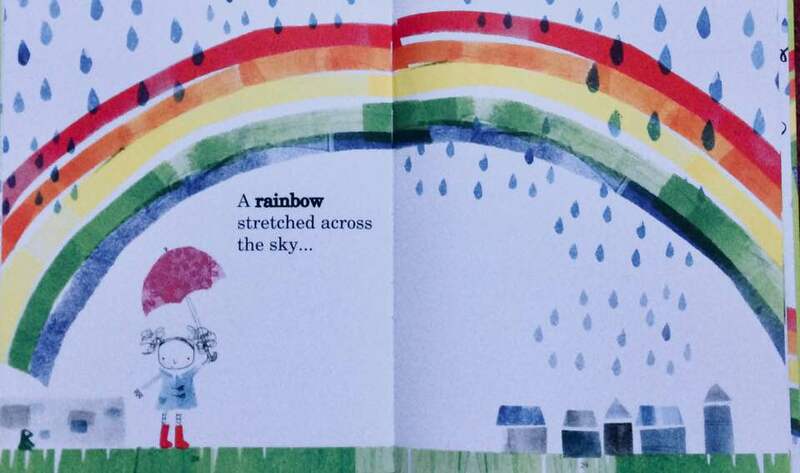 This debut picture book is told with very sparse text. But the real story is in the pictures. Each page is a work of art. A subtle palette and gentle rendering lend an almost dream-like quality to the tale and places you firmly on this little island with Nara. Filled with charm and warmth, it is filled with sensations and you nearly feel the story more than see and read it. 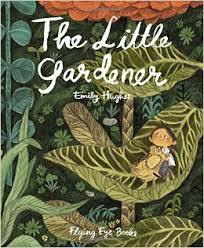 A gentle tale about growing up and the desire to venture into the world, this book is absolutely beautiful. It may be aimed at young children, but frankly, it is one that every age will love. Pete the Badger likes things to be nice and tidy. Just when he thinks he has everything cleaned up in the forest, he notices one fallen leaf and, of course, he picks it up... along with all the others. And what starts with one fallen leaf, quickly escalates to the complete destruction of the forest. Sometimes, tidy can be a bit too tidy. Pete can't even find his own front door! 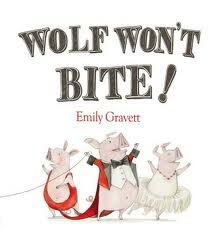 I love Emily Gravett, from Wolves and Meercat Mail, her stories charm, delight and entertain. 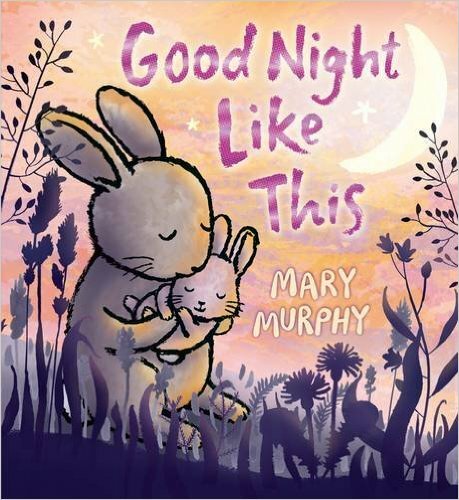 This one seems a return to the form of those earlier picture books, with insightful text and more complex characters and a powerful message about uncontrolled neatness without losing any of her trademark whimsy and fun. Quirky, engaging illustrations set the perfect tone and, once again, tell the story in and of themselves with a fresh and vibrant quality. The rhyming text makes this one easy to read aloud. A unique, thoughtful and humourous trip into the woodlands, this is one for everyone to enjoy and consider. 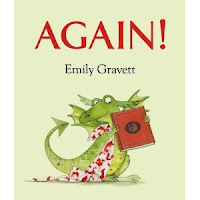 Each and every Emily Gravett book has something special about it, and I recommend them ALL. Veterinarian Harry Coleman was on his way to tend horses in World War 1 when he rescued a bear cub, who had lost its mother somewhere in the fields of Canada. He named her Winnie and decided to take her along with him. They developed a remarkable friendship. Harry taught her to stand up straight, to hold her head high and there was no better navigator in the entire army. But when time came to fight, Harry knew he couldn’t take Winnie into the heart of the war. Instead, he took her to London Zoo and there, this extraordinary bear met a young boy named Christopher Robin…. Written by Harry Coleman’s great-granddaughter, this is the story of the real bear that inspired A.A. Milnes’ classic book, Winnie-the-Pooh. Eloquently presented as a story told to her own son, Mattick’s tale is a magical, yet historical one that could never happen today… but actually did. With wondrous, flowing storytelling and charming watercolour illustrations, this book covers not only history, but geography, as we are taken from the Canadian wilderness to the war-torn fields of Europe and then to London. All along we are given a beautiful story of a most unique bond and inspiration. Parents and grandparents will enjoy the story as much as children. Included in the back of the book are old photographs of those involved in this amazing true story. A wonderful gift for young and old alike. Veterinarian Harry Coleman was on his way to tend horses in World War 1 when he rescued a bear cub, who had lost its’ mother somewhere in the fields of Canada. He named her Winnie and decided to take her along with him. They developed a remarkable friendship. Harry taught her many things…to stand up straight, to hold her head high and there was no better navigator in the entire army. But when time came to fight, Harry knew he couldn’t take Winnie into the heart of the war. Instead, he took her to the London Zoo and there, this remarkable bear met a young boy named Christopher Robin…. 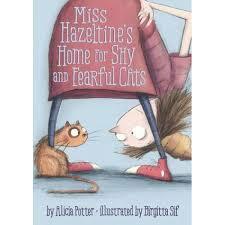 Miss Hazeltine opens her doors to all scaredy cats; cats who are afraid of mice, terrified of brooms, cats who can't pounce or hiss, cats who are too timid to purr. She brings them in, feeds them, loves them and teaches them everything she knows. But one day, when Miss Hazeltine is in trouble, it's up to terribly timid little crumb to organise a search party and bring her home safely. First he has to come out from under the bed....and that may take a while. 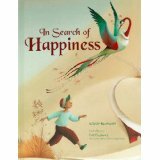 Delightful, whimsical and heart-warming, this is a picture book about overcoming your fears and finding the courage to help someone in need. The story itself is charming and well-written, appealing to all. The rhythm and cadence is clear and memorable.With the addition of Sif's gentle, quirky illustrations rendered in a soft, sketchy palette and style, the story becomes a work of art. The use of space in the book is exquisite, with a combination of double-page spreads and pages with multiple images. Overall, it is a picture that needs to be read, over and over. Very soothing to even the youngest child, I simply fell in love with this book...and I'm sure you will, too. This is a wonderful bedtime read for the youngest of children. 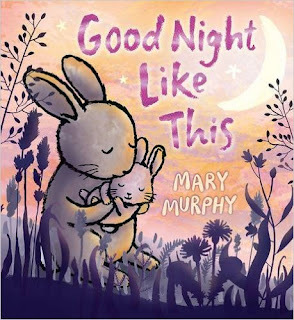 A host of animal families snuggle down to say good night in a beautifully illustrated picture book with sparse but rhythmic text that is sure to lull even the most wide awake toddler to sleep. With lovely, gentle, evocative pastel drawingsA Kiss Like This; Say Hello Like This). It enters a canon of exceptional bedtime books that would include, for example, the classic Goodnight Moon. Simple, clean; the kind of book young children will want to return to again and again. There's not much more I can say about this book except perfect....just perfect. I love it! Little Mouseling lives with her family in Wintermouse Wood. She loves being together, but she is so small...she can't always keep up when her brothers and sisters go out to play. But all kinds of creatures live in the Wood. Still, it can be hard to find the perfect friend just for her....someone who will stay by her side. 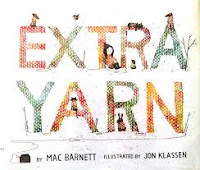 A warm and somewhat quirky picture book about friendship and belonging, this is just lovely. With a beautiful rhyming text and delightful, atmospheric illustrations, even the youngest of readers will be fascinated with Little Mouseling and her plight. Gentle and heartfelt, the story is an important one, lending an ear to that part in everyone that sometimes feels left behind, and that searches for true friendship. There is determination and great joy in Little Mouseling on her quest. Each creature she encounters is wonderfully depicted and they are all great individuals. A quiet, happy read for storytime....and perfect for this time of year! Floyd and Ruby can’t play in the valley behind the houses or they might never sleep again. Very scary things live there, including the scariest thing of all…the Bugaboo! Floyd doesn’t want to go down there. It was only because the best ball he’s ever had rolls away. But Ruby And what will they meet there? There is a choice of paths to follow. The varied paths allow different actions to be taken, new settings are revealed and new characters discovered that the children will need to outwit. In the end, all paths lead to one outcome…a meeting with the Bugaboo! When children engage with a book, they become co-creators of the story. In a rollicking, scary adventure, the readers actively join in and determine the journey Floyd and Ruby take, making this one to be enjoyed again and again without tiring. The lively illustrations add to the entertainment with expressive use of colour and a free, child-like style that flows easily from one scene to the next, regardless of which path is chosen by the readers. There is a great sense of satisfaction in that the reader has active control of the plot action. Ultimately, the story always ends with the same encounter, giving a sense of security and knowledge gained. A perfect storytime choice, don’t be afraid of the Bugaboo! Floyd and Ruby can’t play in the valley behind the houses or they might never sleep again. Very scary things live there, including the scariest thing of all… the Bugaboo! Floyd doesn’t want to go down there. It was only because the best ball he’s ever had rolls away. But Ruby is much braver, so they make the trip together. If they are as quiet as mice, the Bugaboo might not even notice. But which path will they take? And what will they meet there? There is a choice of paths to follow. The varied paths allow different actions to be taken, new settings are revealed and new characters discovered that the children will need to outwit. In the end, all paths lead to one outcome… a meeting with the Bugaboo! When children engage with a book, they become co-creators of the story. In this rollicking, scary adventure, the readers actively join in and determine the journey Floyd and Ruby take, making this one to be enjoyed again and again without tiring. The lively illustrations add to the entertainment with expressive use of colour and a free, child-like style that flows easily from one scene to the next, regardless of which path is chosen by the readers. There is a great sense of satisfaction in that the reader has active control of the plot action. Ultimately, the story always ends with the same encounter, giving a sense of security and knowledge gained. 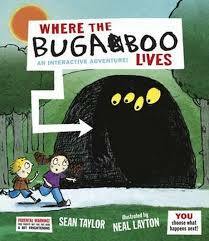 A perfect storytime choice, don’t be afraid of the Bugaboo! Mr. X has stolen the Maze Stone, which has the power to turn all of Opera City into a maze. But never fear! 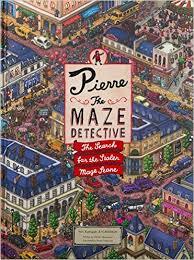 Pierre the Maze Detective and his good friend Carmen are on the case. But can they find their way through the mazes to stop Mr X in time? Rapunzel sits at her window on the 16th floor of her tower block. She just sits, with no where to go and nothing to prove. Rapunzel isn't letting down her hair for anybody; not the milkman, not the post man....not even her Prince. She won't eat; she doesn't leave her tower...she doesn't talk to anyone. All of her friends get very concerned, so with the lift broken, up the stairs they run to see what they do for Rapunzel. But the postman has a very special letter...from the library. That very moment, Rapunzels' life changes. Every day is filled with joy and energy and people and learning new and exciting things. She has a job at the library...and she loves nothing more than reading good books! I really love this picture book! 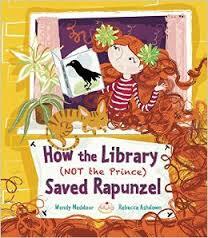 A twist on an old fairy tale, in this version, Rapunzel takes charge of her own destiny and its' all because of books. The illustrations are bright and lively, lending this story a very contemporary air. The rhythm and rhyme make it a joy to read and a delight to listen to. With a vibrant pace and a great cast of characters, How the Library...is a brilliant addition to everyones' bookshelf. At 9:59 on a sunny Thursday morning, Jodie is drawing a duck. Just as she is about to add the last silver button on the ducks' boot, her baby brother stands up and takes his first step...he takes that step as if he is going somewhere! In the meantime, a man buys bread, a soldier hugs his mother goodbye, a baby is being born, some dogs enjoy rolling on the beach and life everywhere is moving along.... and one familys' life is filled with wonder and expectation. Fred is the BEST! He's the champion, and each year, Fred easily wins the Best Bear in the Woods Contest. He is really dedicated to his training. It' takes a lot His friends help him look everywhere, but his GRRRRR! is no where to be found. It looks like Boris, the new bear in town, might just win. Whatever will Fred do? If he's not the champion, then what is he? Biddulph first book, Blown Away was utterly marvelous and charming; so much so it won the Waterstone's Childrens Book Prize 2015. 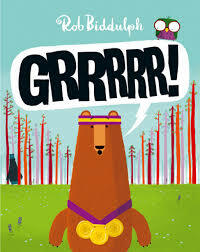 In GRRRRR!, Biddulph returns with another brilliant tale that shows us the value of friendship and that maybe it's okay not to be the best. Maybe there is something more. The illustrations are colourful, lively, and thoroughly contemporary. The lively character depictions with their simultaneous moving and humourous quality set the scene for what is a rollicking adventure with a difference for the youngest of picture book enthusiasts... and for their grown-ups as well. Memorable, enjoyable and wonderful. 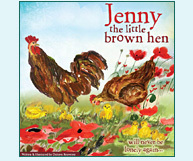 Do you remember Jenny the Little Brown Hen? Her chicks are growing up and becoming bold and adventurous! None more so than Hungry. Hungry the Chick is always wanting more food. It seems there isn't enough in the hen run with Jenny, Sylvester and the others. Hungry remembers what happened the last time when his family set out on an adventure together, but still decides to slip out of the hen run and forage a bit in the field. As a wise and gentle cow points out, this is NOT a good idea! Thank goodness he has good friends who are always looking out for him. Filled with Dolores' bright and lively illustrations, this is the third in the series that began with Jenny the Little Brown Hen. 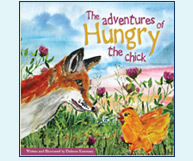 Each page is a painting of in its' own right and the story, simply told with large, stylised text makesHungry the Chick to your picture book collection! There once was a little gardener whose garden meant everything to him. He worked very, very hard morning afternoon and night. But he was just too small; or at least he thought he was. The weeds grew tall, the beautiful plants died and nothing would bloom. Well...almost nothing. In his garden there was one flower that had the most lovely bloom and it gave him hope. One night, feeling tired and hungry and sad, the gardener made a wish... and, after sleeping for a long, long time, he awoke to find his wish came true. 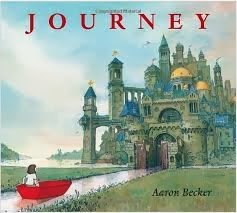 In this picture book, we are transported away to a world very like our own....a world filled with beauty and fantasy in the face of chaos and overwhelming effort. This gentle, beautiful story teaches us the importance of persistence; of belief and having hope. Delicately woven like a tapestry, the magical, luscious illustrations elaborate a story outlined by the simple, clear text. Their detail creates an affect that will captivate for hours at a time. Another absolute joy from Emily Hughes, creator of the beautiful 'WILD', one to share over and over regardless of the time of year. Bear lived on his own in the middle of nowhere, which was just as he liked it. But one day, his quiet life is completely disrupted when a large family of rabbits build their house next door to his! The rabbits are excited to be friends with Bear. They try and try, but Bear just wants to be left alone....and he tells them in no uncertain terms. Finally they get the message...until one day, Bear discovers that maybe, it's all right to have loads of pesky rabbit friends after all. 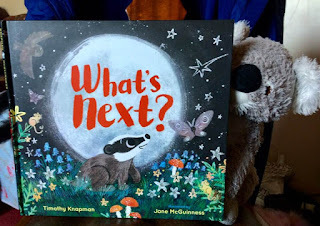 A lively, wonderful picture book which a nice ebb and flow of activity and quietness, this book absolutely charmed me. 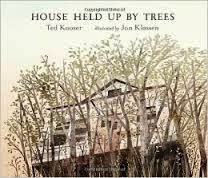 The illustrations and contemporary, with a nice palette that leads you through the seasons (as the backdrop to the story.) A warm, sweet story, without overdoing it; this is a perfect book to share over and over again. An utterly beautiful picture book, filled with colour and vibrancy! 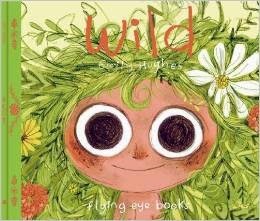 Wild tells the story of a little girl who has known nothing but the nature that surrounded her since she was a baby. The birds talk her how to talk; the bears, how to eat and all she learned about playing came from the foxes. One day, she is discovered by a well-intention couple who take her away from her forest and care for her themselves. But they have it all wrong....they don't talk right or eat right and they certainly don't know how to play. Will she ever be able to be comfortable in her new home? What a pure delight this book is! On each page, you discover something new and stunning. The story is quite brief, but entirely memorable. Alive with colour, warmth, imagination.... and the message about what happens when you try to change something that doesn't need changing. This one sits right alongside "Where the Wild Things Are" (which, if you've been paying any attention at all, you know is my all-time favourite book.) Not enough praise for this gem. Yawnalot is a quiet, sleepy (boring) little town where everybody knows everyone else and nothing exciting ever happens....that is until Abracazebra rides into town with her marvelous magic show. The entire town sparkles and shines! All the animals are enchanted and invite her to stay. But Old Goat becomes jealous and whispers to all that will listen. A sign soon goes up; 'No Stripes Allowed.' So quietly one night Abracazebra slips away, taking the magic with her. What will the animals do now? From the team that brought us the wonderful Snatchabook comes this fantastic new picture book. 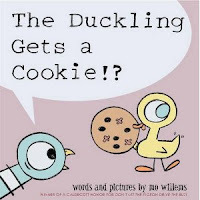 The rhyming story is delightful and children will revel in it over and over. The lively, glorious illustrations are perfectly matched to create another soon-to-be- favourite about friendship, acceptance and celebrating our differences. There is a subtle, yet important message concerning dealing with negative feelings. But more to the point, there is great joy and the wonder of magic! A must-read for everyone! When the house was first built, there wasn't a single tree on the lot. They had all been cleared to make way for the house and its' lawn. But on either side, the lots were filled with trees and bushes. The children grew up with the sweet smell of tree blossoms, playing in the secret places created by the shade of the trees. But time moves on. And so do people. One day, the children have grown and gone and their father, now an old man, moves to the city to be near them. As the empty house begins its' decline, the trees begin to grow, taking over until eventually, the house is theirs. A beautifully told, exquisitely illustrated tale. The children and their father appear is props, nearly and the central characters of this story are the house and the trees. Evocative language spins a life story, showing the entire cycle from birth to demise, with the promise of nature to lift us up. As such, it can be very helpful in explaining death and grief. Both text and illustrations are enough to tell the story, but together, what they create is something truly special. But this is not a typical childrens picture book. It stands as an elegy. It is at once uplifting and sad, the language being detached and cool as it relates the story. A very moving book, reminding me a bit of Virginia Burtons' The Little House. There are so many aspects to this book, I strongly suggest you read it for yourself. Lovely. A small boy is filled with wonder; he is a daydreamer. Everywhere he goes, he is wondering 'what if...' and everywhere he goes he is told to pay attention...to get his head out of the clouds! It is clear that everyone thinks he is a scatterbrain. But his art teacher has different ideas. What will he do with his blank piece of paper? 'Just use your imagination.' Suddenly, there is a way for him to bring his daydreams and wonder out of his head. And the result is pure magic. Wizzo is in training to be a great wizard, just like his grandfather. Early one morning, instead of working at his wizarding lessons, Wizzo can't resist the urge to take just one teeny little flight. But he must well stay away from Dragon Rock; he promised. Now we all know young wizards aren’t so good at controlling their flight patterns. So where do you suppose he ends up? Dragon Rock, of course! There he meets a newly hatched dragon-girl, Dradru . Dradru is so very hungry. So off they fly, finding a lovely meadow for the yummiest picnic. When they meet Little Red Riding Hood, even more goodies and magic are in store. If only that Big Bad Wolf wasn’t about….. If you find yourself having to babysit a Grandma, there is a lot you'll need to know. How exactly do you keep a Grandma busy? When you take a Grandma to the park, what things should you let her do there? What kind of food does a Grandma need? And, what about bedtime??? It's very, very important to keep a Grandma happy, so she'll want you to babysit her again and again. Everything you need to know is contained in this book! 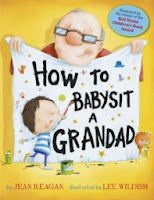 Like the previous 'How to Babysit a Grandad' (see review below), this wonderful picture book warmly address the bond between grandchild and grandparent. The illustrations are contemporary, lively, reassuring and relay the delight and joy in the relationship perfectly. 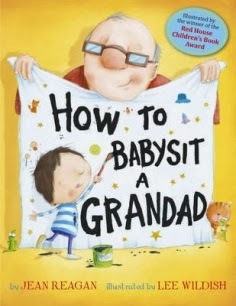 Written in the style of a 'handbook' for young readers, the story also addresses anxieties and fears that children have when spending time away from their parents, but in a humourous and non-threatening way by placing these fears on the Grandma and bringing the child into the position of being 'in charge'. Imaginative and clever, this is one that children will go back to again and again; and Grandmas will want their own copy! 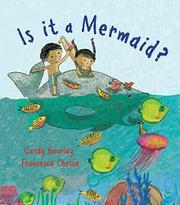 This is a welcome addition to her series of picture books that deal with every day encounters with the natural world. It's just perfect for children (or even adults) with a fear of spiders. The rhyming text makes this an easy read and remember story. 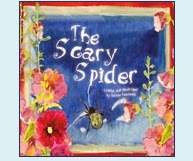 Illustrated with Keaveney's trademark vivid, sumptuous, colourful paintings, The Scary Spider is one of those books that will be read over and over. Joyful, beautiful and utterly delightful and one I'll be sharing with the little people in my world. Brian was the smallest boy in the village. He loved nothing more than playing warriors with his brothers and fishing and hunting. One day, they spot a Viking ship drawing near. Fortunately for everyone, while Brian is the smallest, he is also the most clever. 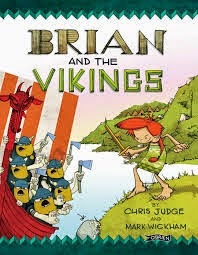 Brian concocts a plan to scare off the Vikings by using the one thing they fear most and the entire village joins in! But will it work? What an utterly delightful introduction to the life of Brian Boru, who grew to become the High King of Ireland. Using such a legendary character as the centre of a picture book is no easy task. But Judge pulls it off with style and creates a wonderful adventure that even the youngest children will love. 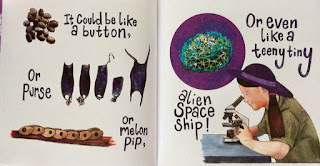 It is also important to note that Judge (author/illustrator of such fantastic picture books as The Lonely Beast and The Great Explorer) is the author only of this tale, showing adeptness in the creation an exciting storyline with minimal use of text. The illustration work is expertly handled by Mark Wickham. And what a treasure! The use of colour and line perfectly suit the story and create drama in and of themselves. The colours are bright, without be overly much so, and generally, the pictures give a real feel for the time and place, as well as the action. Overall, this picture book is a huge success. I am delighted to have it on my shelf...and you will be, too! As Little Ellie and Granny are on the way to town one morning, Little Ellie asks for a story. "Deep in the woods no far from here...." Granny begins to tell her the story of Grandma Bear and Little Bear and their wonderful, exciting trip. But these are no ordinary bears. They wear hats and wellington boots and go on adventures. And maybe the story Granny tells isn't just a story! So...we're just settling down for a nice quiet read of 'The Ugly Duckling', when what happens? A crocodile(!) falls into the story and, boy, is he furious! Well, wouldn't you be if you'd fallen into the wrong story? 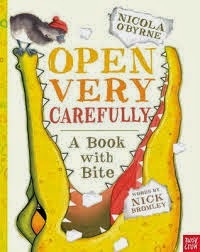 Not belonging has really upset him, so the crocodile begins to eat his way out of the book. He chews on the pages. He even eats the letters! (It seems his favourites are 'S' and 'O'.) Should you slam the book shut and put it back on the shelf....or are you brave enough to peek between the covers? Every day, Oliver goes to the shops. Every day Troll is lurking....waiting... one day, he will get to eat the Oliver!!! But Oliver is too fast, he's too clever and he's too sneaky. Just on the day when Oliver thinks Troll has given up and he has won; CHOMP! 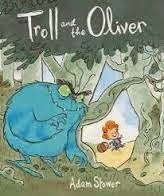 Troll eats the Oliver! But fortunately for Olivers everywhere, Olivers taste disgusting! What will poor Troll do? He's so hungry. The Oliver has a brilliant idea... cakes taste delicious! Elliott is a young boy who loves to find things. One day, while searching for 'things', he finds a mysterious machine...a machine the likes of which he has never seen before. Elliott has no idea what the machine is for; it doesn't plug in, it doesn't make the same sounds machines normally make and there is no on/off switch. Quite accidentally, Elliott discovers that the machine makes letters. It must be a story machine! Elliott isn't good with letters and words...but he is good at pictures and some of the letters LOOK like pictures, especially when you put them together in different ways. And pictures make stories, as well as words! 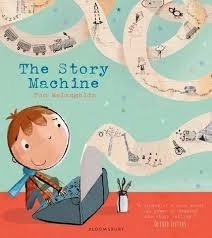 This is a wonderfully illustrated, gentle and fun story of a small boy, his imagination and a typewriter in the digital age. Even the youngest among us will be captivated by the tale. The illustrations are simple, clear and, with it's subdued colour palette, very befitting of the narrative. The story is fresh and magical in it's own way. I just love this one! Babysitting a granddad is great fun, but you have to know… what to feed him (ice cream topped with cookies; olives on fingertips), how to entertain him (put on a scary play) and what to do with your granddad on a walk and when he gets tired (have him read a really long story…over and over). Everything you need to know is in this book! Including the hardest part of all; how to say goodbye so your granddad will be happy to have you babysit him again and again. This book is an utter delight, quietly told with detailed, wondrous illustrations that perfectly match the text. An entire cast of favourite fairy tale characters feature throughout. The introduction of a new and unique magical creature makes this story an instant favourite. There is much to see; much to talk about. The well-written, accessible text is happily read over and over. 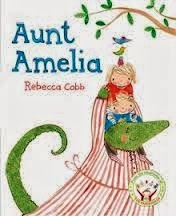 Not only will children love it, but it is an important one for parents (and teachers) to share as it emphasises the importance of storytime and reading together, and demonstrates compassion, even to the youngest reader. Beautiful, fascinating, adventurous... one to add to your permanent collection and enjoy for years to come. When a lonely girl, desperate for her family to notice her, draws a magic door on her bedroom wall, she sets off on an adventure beyond her wildest dreams. With her red marker, she creates a boat, a balloon, a magic carpet; and she travels through a world of wonder, beauty and danger. She is captured by an evil emperor, and it only only take an act of pure bravery and uncommon kindness that can set her free. But what will it take to get her home and safe? The boy and his family are different from the others. The others hunt the hares, hoping to find the elusive golden hare. But the boy and his family rescued orphaned leverets, keeping them safe from the hunt. The boy and his family hold the secret of the song of the golden hare and will wait all their lives, if needs be, for the moment when the old queen leaves and her child takes her place. But the hares are on the move, and the hunters are out. Can the boy and his sister keep the old queen safe? Can they protect the young hare? Will they be able to sing the song of the golden hare? This is an absolutely stunning book! The storyline is warm, gripping and moving. The illustrations are simply exquisite. Delicate and intricate, each page is a work of art on it's own. Woven in to the story is an awareness and wonder of the natural world. There is something inspirational about this picture book, for many reasons... in it's artwork, in it's story and in it's characters. Song of the Golden Hare was written to be a classic and one the entire family will cherish for generations. 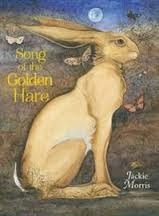 For more by Jackie Morris, you might try I Am Cat, Tell Me A Dragon and Little Evie in the Wild Wood. Mum and Dad are going away for the night. This puts one little girl and boy in a very bad mood. They don't want to be looked after, especially by Aunt Amelia. To make matters worse, Mum and Dad have left a list of all kinds of boring instructions...don't do this, don't let them do that. Horrible!!! But, Aunt Amelia, it seems, is a bit different from what they expected. She's a lot more fun! Maybe Mum and Dad will go away more often! When Amy goes to stay with her granny on her own for the first time, she packs everything she will need, including her three best things. On the first night, Amy’s little mat becomes a magic carpet on which she flies home to check on her mother, her baby brother and her dog. The second night, her tiny wooden horse grows to just the right size and whisks Amy back to peek in the windows and see that everyone is just as she left them. 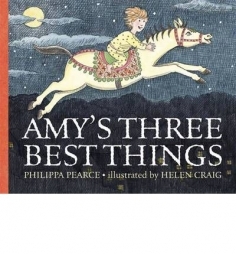 But on the third night, when Amy wakes to the sound of thunder and lightning, her little boat sails her to her house only to discover her family isn’t there. Tearful and afraid, Amy goes back to Granny’s and finds her family waiting for her. I do love all of Philippa Pearce's books and when she is teamed with Helen Craig, it's pure magic!This gentle, magical story is simply perfect for a child dealing with fears of the unknown; something we all need help with from time to time. Through the use of familiar objects, we see a little girl find comfort. The repetitive night-time action adds the reassurance of routine that demonstrates you can face your fears and all will be well. 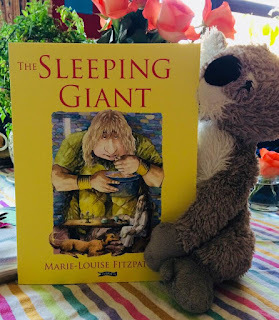 Somewhat traditional in approach, this is a wonderfully written tale by one of the giants of children’s literature and imaginatively, evocatively illustrated by another. I can’t think of a better book to take on a first stay away from the security of home; or as a soothing bedtime story to wash away the ‘busy-ness’ of the day and settle into dreamland. Little Mouse is back and has found a new book. This time it's filled with all manner of scary beasts. But Little Mouse is not afraid... he boldly goes about the business of removing or changing the scariest bits... mittens for the lion, ruby red lips on a shark.... and suddenly the beasts aren't so scary after all. Emily Gravett is an absolute genius! All through this wonderful new picture book, there are flaps to lift, jokes and pure joy. The illustrations are both charming and contemporary... and always surprising. 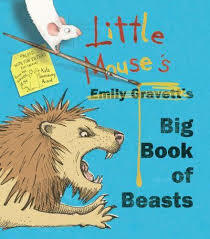 Just like it's predecessor, Little Mouse's Big Book of Fears, this one is perfect for sharing with the whole family! Love it, love it, love it! Lion is really mean! He picks on all the other animals... he gave Buffalo a wedgy, stuck a silly note on Zebra; he even stole Hyena's lunch monkey! All the animals are really frightened of him, but they are tired of being bullied. So they put an advertisement up on the internet. Help finally arrives in the form of Rabbit. 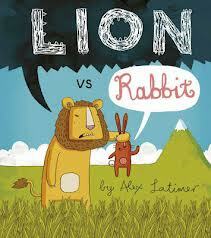 But can a small rabbit really win in a contest with a lion? This is a wonderfully funny and cleverly worked picturebook that gives understanding and information about how to deal with bullies. But more than that, it is utterly delightful. A welcome addition to your picturebook shelf, with illustrations by the author that make the story accessible and entertaining. From the author of The Boy Who Cried Ninja and Penguin's Hidden Talent; Alex Latimer really understands what it's like to be a child! Zoe has found a guinea pig at the back of the garden…. and another guinea pig! And a tortoise, and a chameleon that changes colour, and a noisy parrot that only says ‘Hello Oscar!’ no matter how hard Zoe tries to get him to say her name. But where have they all come from? Could they have crawled through the hole in the fence? Behind that hole, there is another surprise for Zoe! 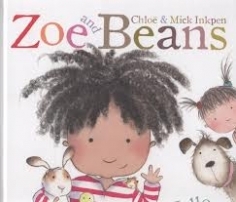 Mick Inkpen (of Wibbly Pig fame) and daughter, Chloe, have created Zoe and her dog, Beans, to address and enchant the world of toddlers. Vibrant illustrations and minimal text work together here to create the story of our young friend, Zoe, as she finds a host of animals creeping through her garden. The natural curiosity of children is well evident, as Zoe seeks to find out what each animal needs, fostering a basic environmental interest. A nice contemporary twist is added when she rushes back inside to Google what it is chameleons eat. The lively, toddler-friendly pictures could tell the story on their own, not only giving beautiful depictions of the animals, but illustrating a range of emotions from delight to curiosity to frustration, and ultimately back to delight as Zoe finds a new friend. But the simple, clear text, well designed in conjunction with the illustrations throughout, give it the repetitive quality that a picturebook for young children needs to become a firm favourite. For two- and three-year-olds, Hello, Oscar! is engaging and delightful. A little girl called Dot in London shares a birthday with her grandma in New York, also called Dot. Both of them are planning a big birthday surprise for the other. 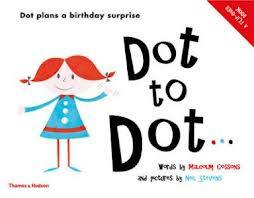 Follow little Dot as she attempts to hand deliver a birthday card to Grandma Dot, . Then... flip the book over and learn all about Grandma Dot's plan to make a surprise visit to London. The big question is, will Grandma Dot make it to London in time for the big birthday; and will little Dot even be there? Adventurous and heart-warming, each character is determined to create a special memory for them both. This is an absolutely charming and gently exciting story. The illustrations have a decidedly retro feel, and the whole design of the book will bring up reminiscences of books from our own childhood times. Flip-books are rare indeed these days, making this a truly unique gift. I absolutely love it! 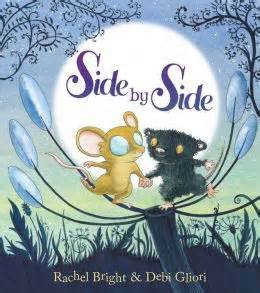 This is an extremely charming, wonderfully illustrated story about friendship, sharing and... well... food! Any child can relate to this little girl, as can any parent. 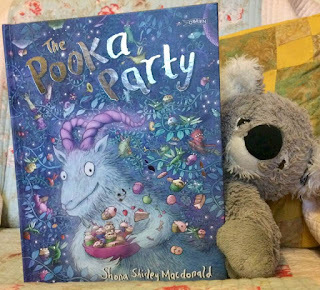 Sure to be a favourite as soon as you pick it up, I highly recommend this beautiful and fun picture book from one of the most delightful, new illustrators around. Princess Primrose's life can be pretty dull. She isn't allowed to climb trees, splash in puddles or the Royal Fountain, or dig up vegetables in the palace garden. Then, one day, Primrose's royal Grandma comes for a visit. At first it looks like life will be even more prim and proper, until everyone discovers that the real reason for Grandma's visit to to remind This is a brilliant, happy picturebook for will delight every member of the family. 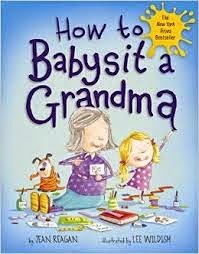 Lively illustrations and wonderful characters throughout, it's also a great reminder of the relationship between grandparents and their grandchildren. Poor hungry badger! When a boy drops his sandwich in a sandpit, Badger is just not fast enough to grab it. But he follows the sandwich on it's journey as it gets squashed, squished, dropped in a puddle and slithered all over by slimy slugs. Will he ever get a chance to have a meal? And if he does, will he even want it? 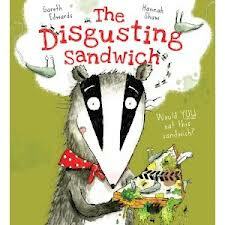 It could be simply too disgusting!This is an utterly delightful, completely entertaining story. The illustrations are contemporary, bright and full of character and life. The writing itself is marvellous... filled with beautiful alliteration and loaded with information on animal behaviour through to hygiene and food safety.... a great one to share that will amuse boys and girls alike. Annabelle lives in a dreary little town. One cold, dark, dreary day, she discovers a box of yarn and decides to knit herself a jumper. There is still some yarn left over, so she knits a jumper for her dog, as well. But there is still extra yarn. In fact, no matter how many jumpers she knits, there is always extra yarn. Once the whole town is decorated in their rainbow coloured jumpers, it doesn't take too long before the evil Archduke hears of the miraculous box of never-ending yarn and must have it for his own! Of course, things don't turn out quite the same for the Archduke...... I absolutely love this book! It's gentle, yet exciting writing tells a miraculous tale to be read over and over with out getting tired of the story. The illustrations are timeless, yet contemporary. This book is destined to be treasured by the entire family! Get carried away on a magical journey through Ancient Ireland is this expert and eloquent retelling by Siobhan Parkinson. Learn how beautiful Etain becomes a butterfly and what becomes of her. Hear of Fionn Mac Cumhaill's great mercy in sparing the life of a white doe, who is in fact an enchanted princess. And what of the children of King Lir, who have been magically changed into swans by their evil and jealous step-mother... Seven tales from old Ireland grace these pages, told in their original format for younger children to grow with. The exquisite illustrations perfectly compliment the stories and add to their enjoyment. This is a book for the entire family to treasure for years to come. While there are many collections of Irish myths and folk tales, this is by far one of the best. A gift for us all! This book is absolutely stunning! A Caldecott Award winner, it is everything a picture book should be. Flotsam tells the very simple story of a young boy playing on the beach. And it tells the story entirely without words.He comes across an old, very, very old, waterproof camera containing the most extraordinary photographs. Words are not needed here, and in fact, would only be a distraction and entirely in the way. 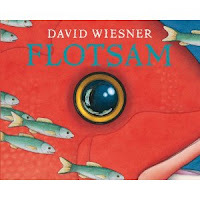 Flotsam is one of the books that children young and old will spend hours pondering over, lost in it's pages and taken away into another world entirely, while at the same time, opening up to the present world with new vision and awareness. It is completely absorbing and enchanting. Truly, truly beautiful! The Pigeon (from Don't Let The Pigeon Drive The Bus fame) is back, and this time he's brought his friend the Duckling along with him. 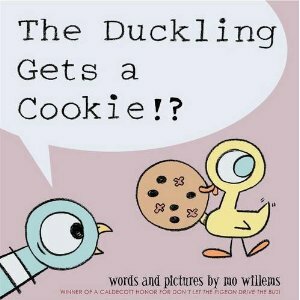 When Duckling, with her bright eyes and beautiful manners asks politely for a cookie, of course she gets it. But, oh-oh, Pigeon finds out and isn't happy at all about this! In fact, Pigeon is outraged!!! What does a poor Pigeon have to do to get a cookie???!!! 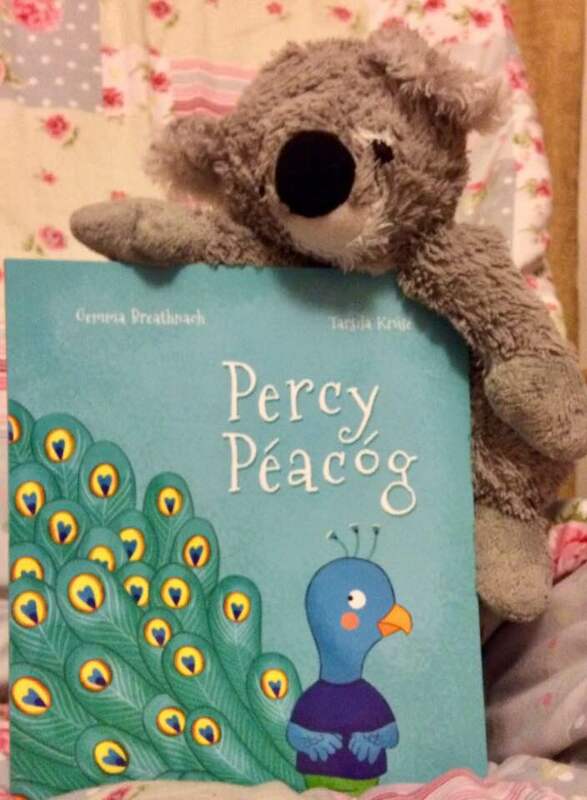 A wonderful, funny tale of Pigeon and manners and friendship. Brilliant! 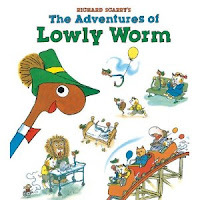 Lowly Worm has certainly had an eventful life... full of adventures with all of his friends in Richard Scarry's many, many books.. What Do People Do All Day, Funniest Story Book Ever, Cars and Trucks and Things That Go... he's been in all of them and become one of Scarry's most beloved characters. Now he has a storybook featuring himself! Follow Lowly Worm as he gets lost on the subway, helps Huckle find the perfect birthday gift for Mother Cat, and rides in a hot air balloon. I've always loved Ruchard Scarry's books and Lowly is a particular favourite of mine. Scarry's books are packed full of stories, information, wonderfully drawn illustrations and characters that are memorable for life! This is one more of those books; the kind you will find children pouring over again and again, examining the pages, noting the detail and totally engrossed in wonderful stories. I wanted to point out two very lovely, wonderful picture books by Irish author, Dolores Keaveney. 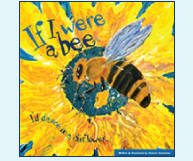 Told in a rhythmic and repetitive rhyme, If I Were A Bee takes us on a journey through all the possible activities of a honeybee making its’ way across garden, field and meadow. The text is wonderful, but what really makes this book is the brilliant, lively illustrations which tells the story on their own. Younger children can be seen pouring over the pages again and again, each time noticing something new. If I Were A Bee is clearly a labour of love and a pure joy. ISBN: 9780230745360 It's little Cedric the dragon's bedtime, and there's just time for his mother to read him a bedtime story. But as all mothers know, it's never that easy. Cedric always wants to hear his favourite book...again and again and again! Mummy is tired, but that doesn't matter to Cedric. What happens to a young dragon when he loses his temper? 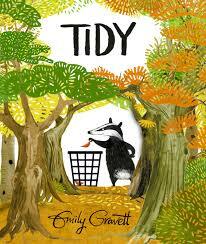 This book is another gem from Emily Gravett. The tone and the plot are familiar to all parents and children alike. The illustrations are charming and quirky, and work in perfect harmony with the text. AGAIN! is sure to become one of your bedtime favourites.... but, maybe have a fire extinguisher handy. Simply wonderful! The pictures themselves tell the story eloquently, adding much to the simple clear text. Otto’s character is purely lovable, kind and sharing, and a bit mischievous. This is a wonderful book to share with the whole family, expressing a love of books and reading. Kate Cleminson gives us a lovely story of sharing, joy, of losing and finding again... and, of course, of books! Once there was a boy called Henry, who wanted (more than anything in the world) the perfect pet... a dog, of course. So Henry places an advertisement in the paper. Surely, this will get him the perfect pet. Tiger is getting old, thin and sad. It is far too difficult for him to catch the food he needs. So, one day, he seizes the opportunity to take the place of an old tiger-skin rug in the Rajah’s palace, where he begins a life of luxury, in secret. But his days of living undiscovered in the palace come to an abrupt end when three robbers burst in and Tiger has to save the Rajah! And he proves that Tigers who live in captivity can have happy endings, too. This charming picture book is a pure delight. In this perfect read aloud story, the bright, contemporary illustrations lend a light comic touch and give form and expression to the characters, and fast-paced action to the tale. This is Gerald Rose at his best! A not-to-be-missed offering from the Kate Greenaway Medal winner that is a happy edition to every bookshelf. Grampa to believe him? Then Tim comes up with a very simple, yet remarkably brilliant idea to prove himself. This book is a pure delight! It's a funny, improbable, fast-moving cautionary tale that not only speaks of the importance of telling the truth and of having faith and trusting those you love (no matter how unlikely it may seem.) It also speaks very clearly about the importance of believing the truth when you hear it. Simply wonderful! The latest offering from Emily Gravett, a take on the old 'Three Little Pigs' story, is just brilliant.sparce in it's language, this is classic Gravett. Humourous, delightful, and, yes, cautionary... this book is everything that makes Emily Gravett one of the best picture book author/artists available to us today. Wonderful! Ty Tyrannosaurus is the biggest, baddest dinosaur around, with his terrible roars and his big, big mouth and his enormous appetite. His little sister, Teri, absolutely adores him and follows Ty everywhere he goes. But when Ty goes hunting, Teri is a big, big problem. When Ty finally gets the message across that Teri is a pest, and stomps away leaving Teri to cry and howl alone, Teri nearly becomes another dinosaur's lunch! That is, until big brother Ty save the day and discovers that, maybe, being adored by a pesky little sister isn't so bad after all. The bright, expressive illustrations create a lively, colourful land and perfectly illuminate the rhythmic text of this story. 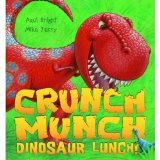 'Crunch, Munch, Dinosaur Lunch' is an absolutely wonderful and humorous tale that exposes the trials and tribulations and triumph of being a big brother. 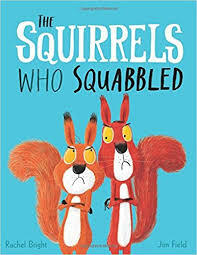 Sure to become a firm favourite, especially for those families who find themselves living with sibling rivalry, I whole-heartedly recommend this brilliant picture book for the whole family to share. choses the gift of his hearts desire..... a bell from Santa's sleigh. Written 25 years ago, this book has grown into a classic, with good reason. Beautifully written and illustrated by Chris Van Allsburg, The Polar Express speaks of the pure magic and delight of the season. It leaves behind a world of materialism and cynicism and conjures a moment of belief and wonder. While it was made into a film a few years ago, I thoroughly recommend, in fact I insist, that you read this eloquent, gentle picture book, and share it with the entire family. The simplicity and innocence of the story and the beauty of the illustrations will warm your hearts on cold winter nights. 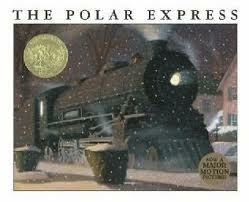 The Polar Express is a powerful seasonal tradition in our house. It's tender message speaks most poigniantly to those of us who can no longer hear the perfect clarity of the bell. The Polar Express has had numerous reprintings since 1985. 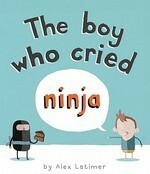 It is now available as a paperback picturebook with CD read by Liam Neeson. The Heart and The Bottle is now on the short list for the DAA Irish Children's Book of the Year, and throroughly deserves to be there. I love this book! It's a bit of a departure, in a way, for Oliver JeffersJeffers explores love and loss in this lovely, life-affirming tale. But it does more. 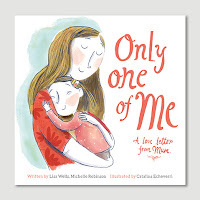 Most books for children dealing with grief focus on the one who has departed. This book explores how loss aftfects the girl as she grows into life and what becomes of her. It explores how life itself calls to her (to us all) and gives it's moments to be reclaimed... and to become full of wonder again. Absolutely beautiful! Alexander lives with his Grandfather in a very safe and lucky place called Prudence. No one in Prudence is ever unhappy... "they never took chances, they were never disappointed." But Alexander is not happy. One day, when a beautiful songbird, Paradiso, lands in front of him and offers to take him to the Land of Happiness, a great adventure begins for Alexander as he takes of in search of happiness. At every stop along the journey, he pauses to write back to his Grandfather and tell of his progress. But, where is the Land of Happiness and will Alexander ever arrive? 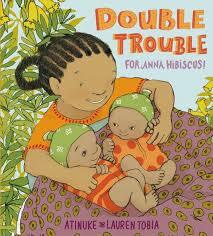 This is a warm and well-written fable style picturebook written by Juliette Saumande. While the story is a familiar one, in the telling is a quality genuine and unique that truly sets it apart. Stylized, exquisite illustrations by Eric Puybaret (illustrator of 'Puff, The Magic Dragon) perfectly accent this tale as it carries the reader along. 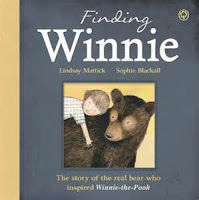 A wonderful and timeless picturebook to be treasured. Two farmyard friends decide to give into their wanderlust and take off in a brilliant 'free-range' adventure with some surprising results. And along the way, they pick up some pretty unique friends. 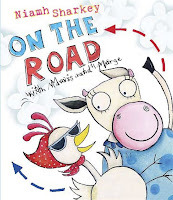 A bit like 'Thelma and Louise' for the pre-school set, "On The Road With...." is a fun and wonderfully amazing picture from the wonderful Niamh Sharkey, author/illustrator of some of my other favourites such as 'The Ravenous Beast' and 'Santasaurus'. The illustrations are bold, fanciful and contemporary. The story is wacky, entertaining and gives you something to think about. 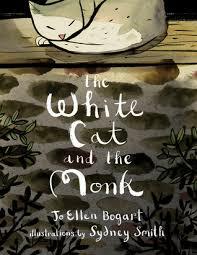 This great choice for my picturebook of the week is published by (of course) those wonderful folks at Walker Books. 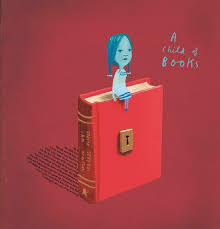 I am so in love with the latest offering from Oliver Jeffers, Up And Down. In this picturebook, Jeffers has returned to our old friends from Lost And Found, the boy and penguin, a truly winning formula. The boy and the penguin have a wonderful friendship and enjoy all their time together, until penguin begins to dream of flying. While the boy strongly advises him against this notion, the penguin ignores the boy's words... and wanders off, believing he is about to get what he dreams of. Don't worry, it all comes good in the end. Jeffers eloquent and economical illustrations guide us through this latest journey and communicate more than words ever could. Please, please read this book! This story is quite reminiscent of 'Are You My Mother?' by P.D. Eastman. A young owl is sitting next to his mother, beginning to doze a bit and topples off his perch. When he hits the ground, he realizes he's a bit lost. Never fear! Squirrel is there to help and knows exactly where his mother is.... or not at all. As he and squirrel meet all sorts of creatures in the forest, none of which are his mother. But thanks to the assistance of a knowledgable frog, it all comes good in the end. The entire cast are treated to biscuits.... and little owl begins to doze off again. The brilliant, simple and clear palette of the illustrations tell the story in and of themselves. 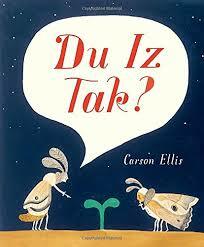 The economy of language makes this a classic picturebook which will stand the test of time. Eloquent, charming, and not at all twee, this book is a true gift! Douglas is a big, brown, furry super-cuddly bear. He wakes up one morning in need of a hug and sets off to find the perfect one....but none of the hugs seem quite right. And with the mayhem he's causing, how will Douglas ever find the right hug for him? 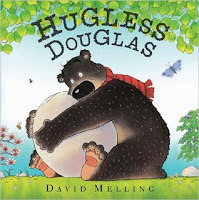 David Melling's story and illustrations give a wonderful story for hug seekers (of all ages.) My choice for picture book of the week. My picture book of the week has got to be Cave Baby by Julia Donaldson and Emily Gravett. Just out today, this book is pure delight. It tells the story of a cave baby who finds himself in trouble with Mum and Dad when he draws on the walls. What child hasn't been in that situation? Late that night, a wooly mammoth grabs him from his cot and takes him through the fields and the jungles...but to where? Surely not to the big brown bear! 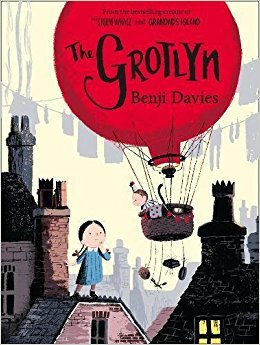 With the magnificent story-telling skills of Donaldson and Gravett's perfect illustrations (that tell the story of their own accord) This book is simply wonderful. I'm putting this under picture books, though technically it's an early reader from the Blue Bananas series. This is due to the marvellous contemporary and quirky illustrations by Joelle Dreidemy that perfectly accentuate a great story by Galway County author Patricia Forde. When little sister Lola locks herself in the bathroom and refuses to come out, the police, a fireman, a plumber and even Lola's own family can't solve her problem. That's because a witch has appeared, gotten very cross and conjured up lots of frogs....and, as Lola knows well, frogs do not like dragons. 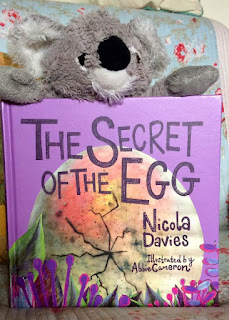 Told in the voice of big sister Natalie, the story takes us on a brilliant journey through a common problem faced by families everywhere; with a unique twist. Utterly delightful, I am very pleased to report that there will be more Lola stories in the future. 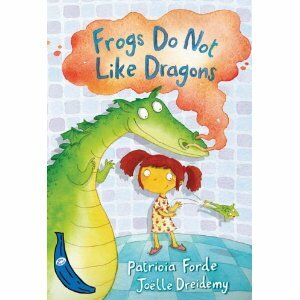 Check out Lola's own blog on Patricia Forde's website.